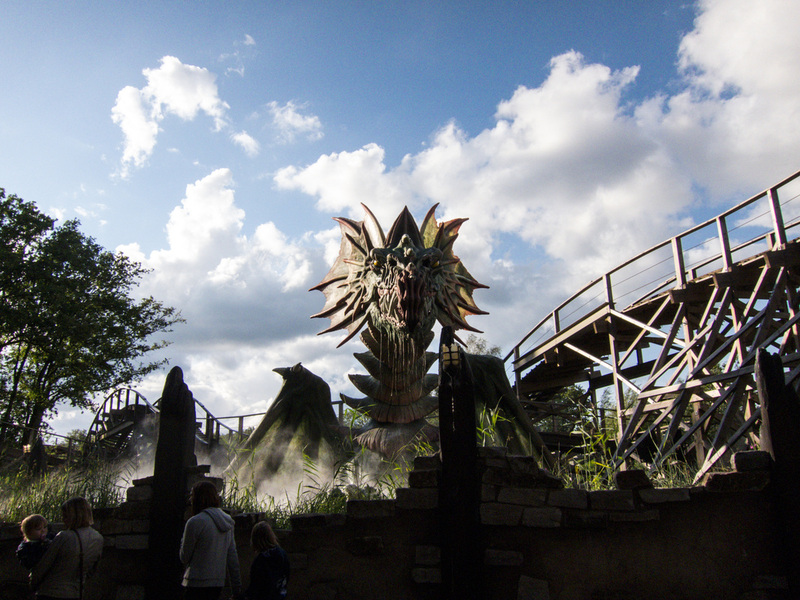 Ready for a thrilling battle against the dragon? 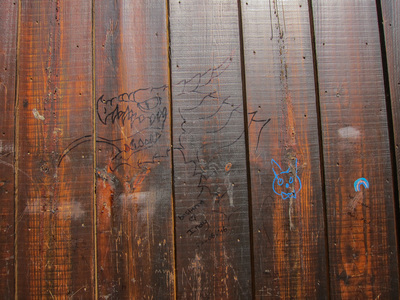 A dragon, the ruler of Water and Fire, threatens the kingdom ... 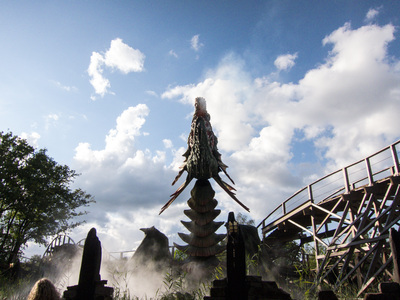 The king calls upon all brave citizens to defeat this monster. 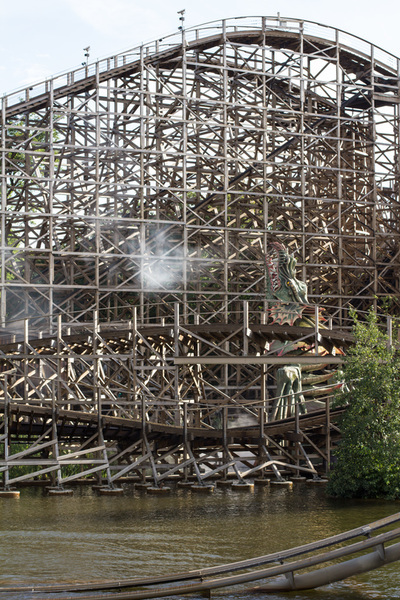 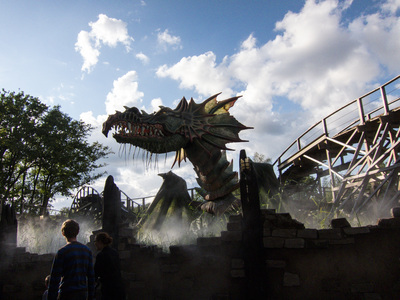 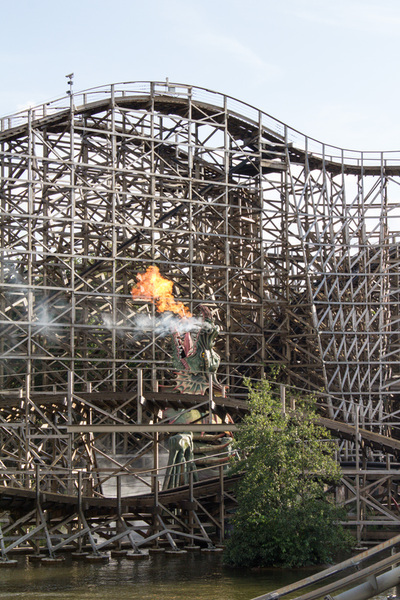 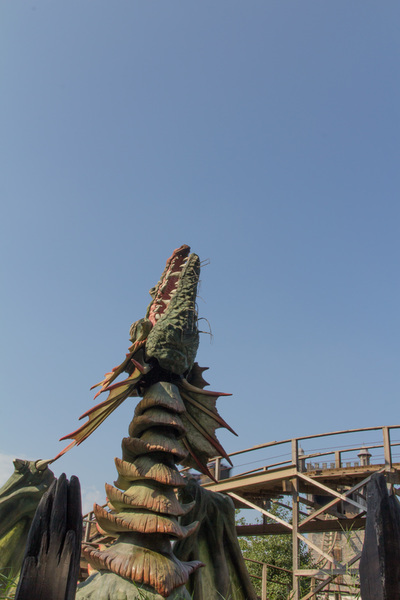 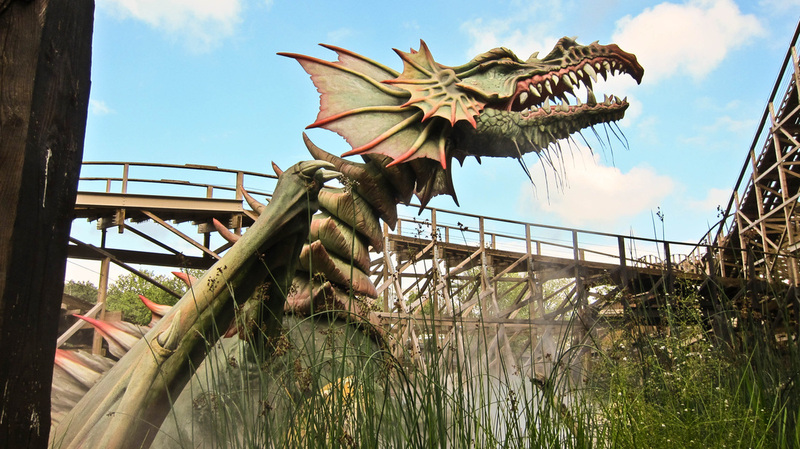 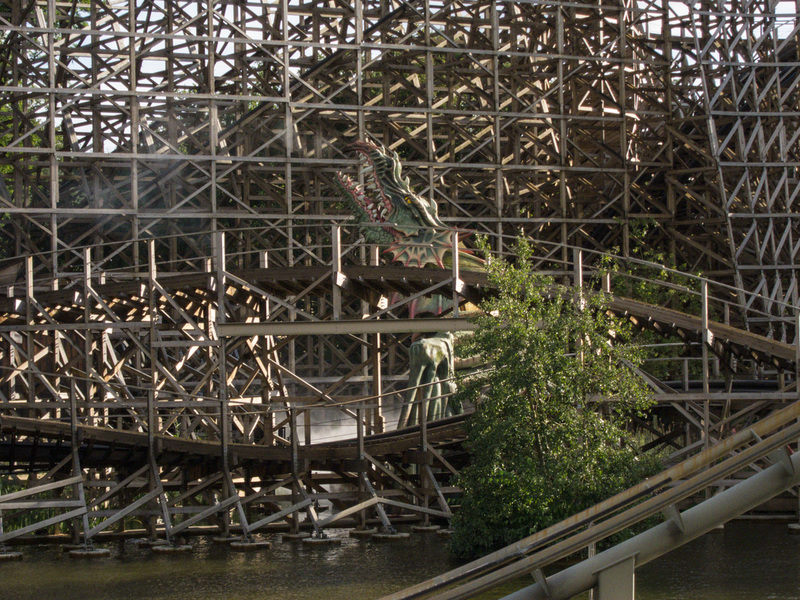 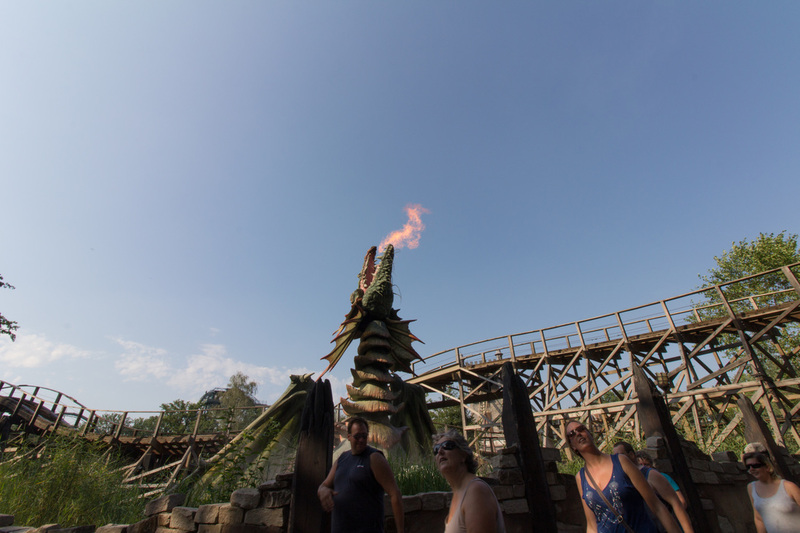 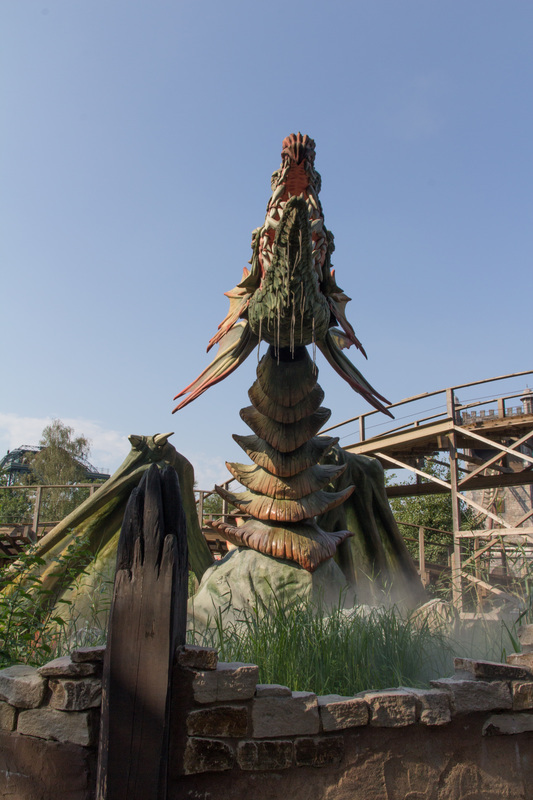 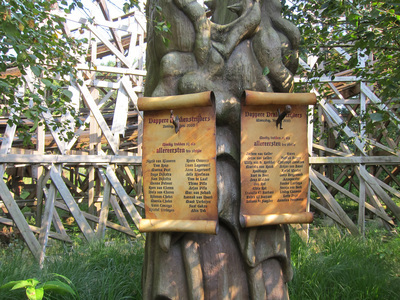 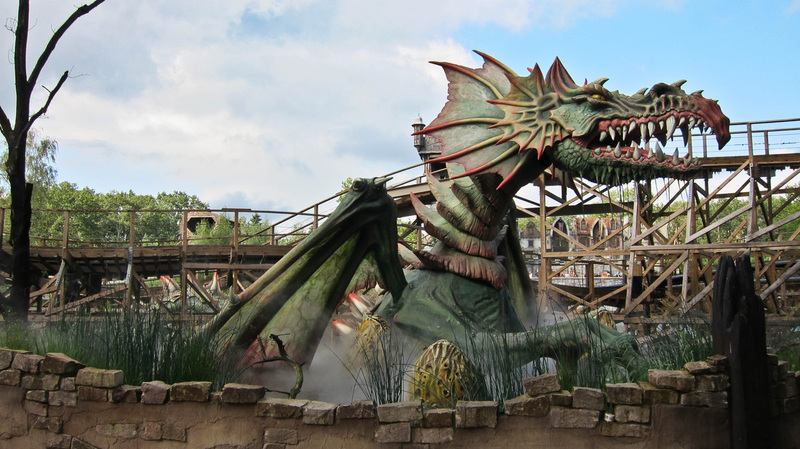 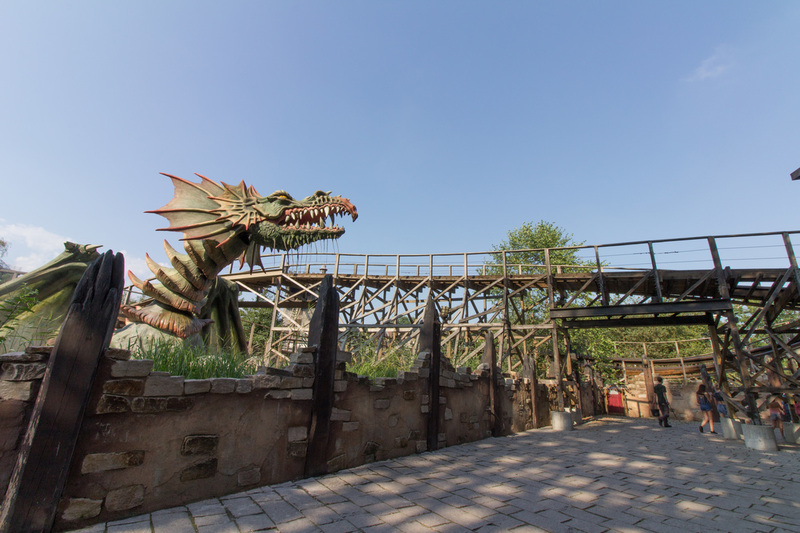 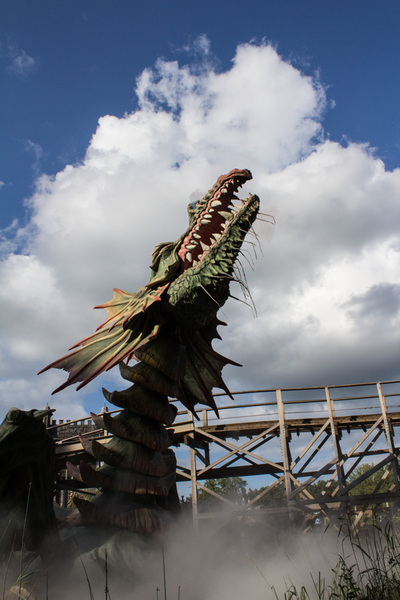 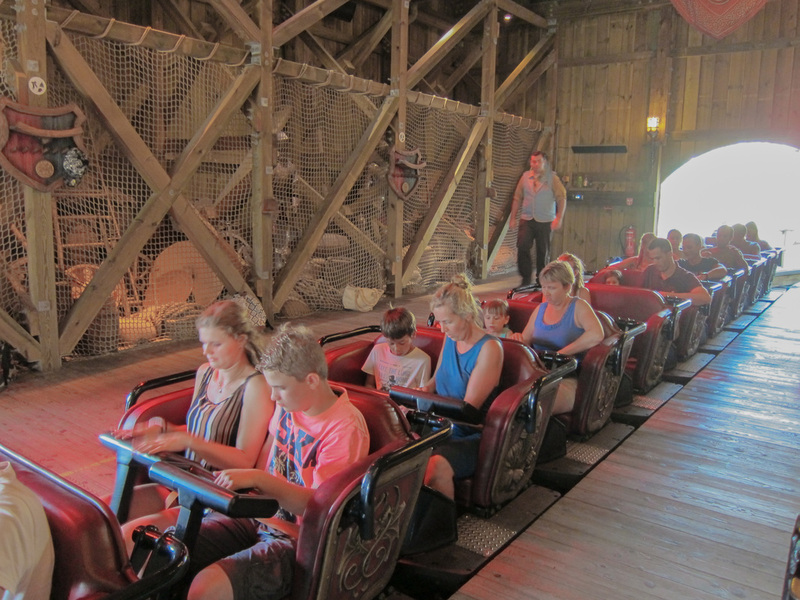 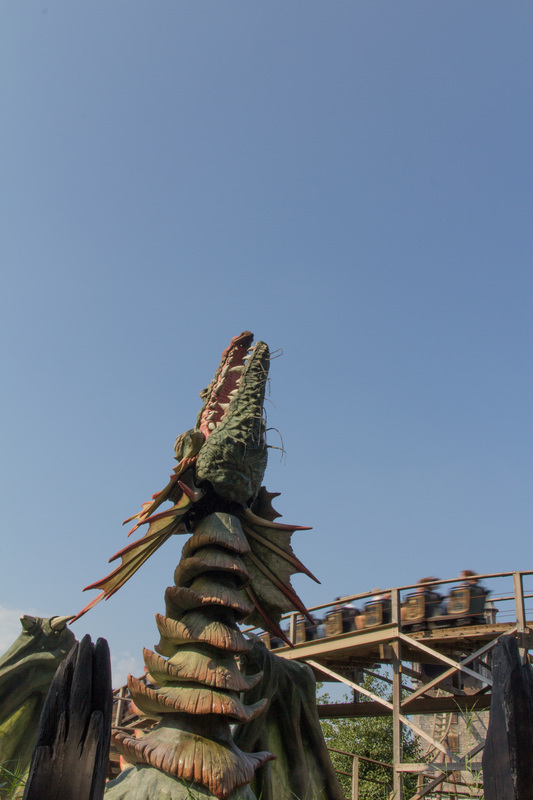 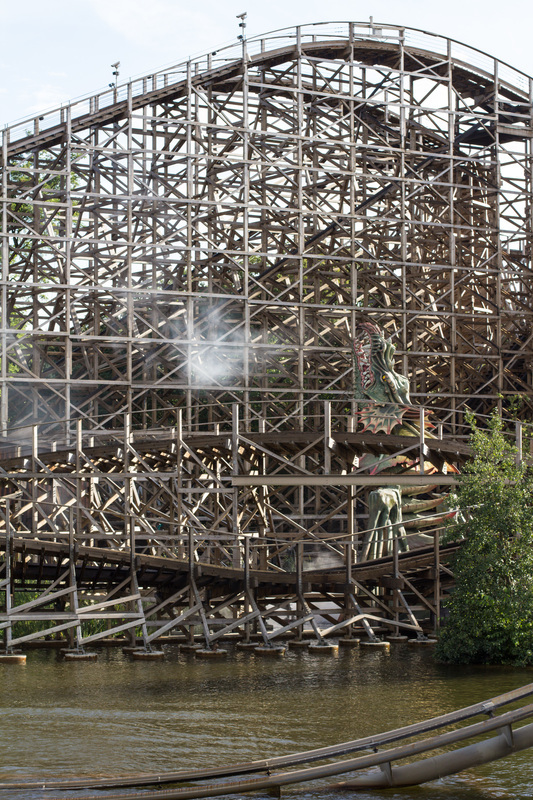 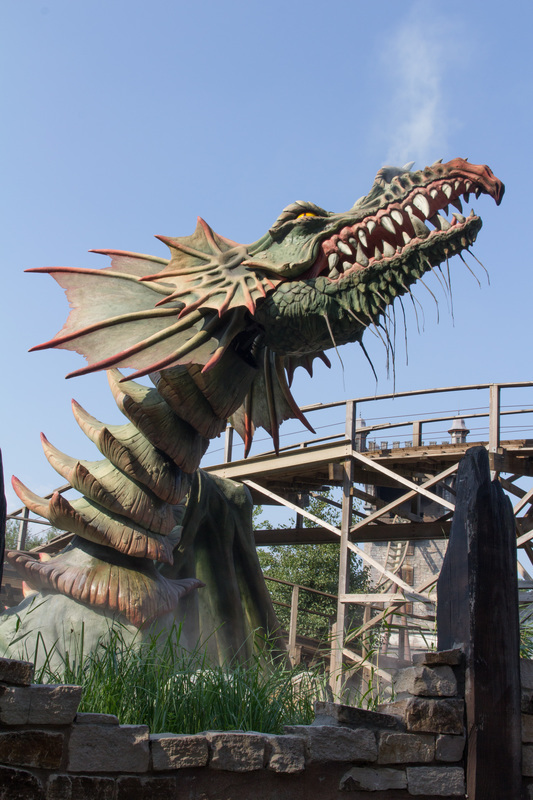 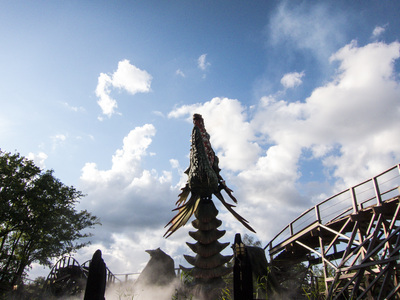 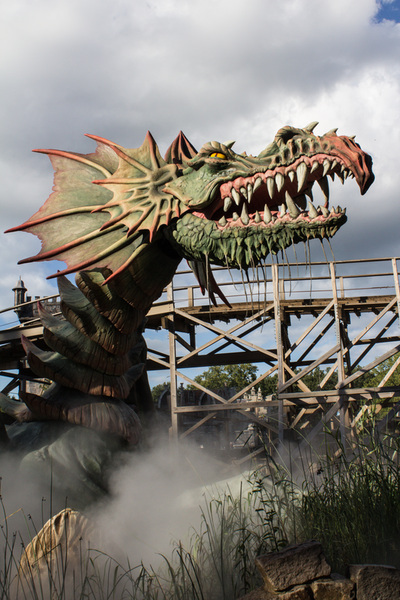 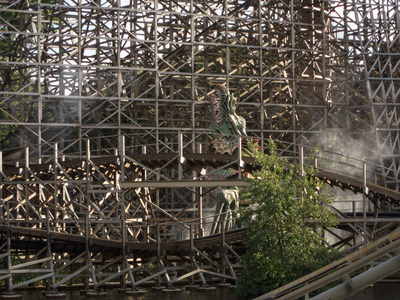 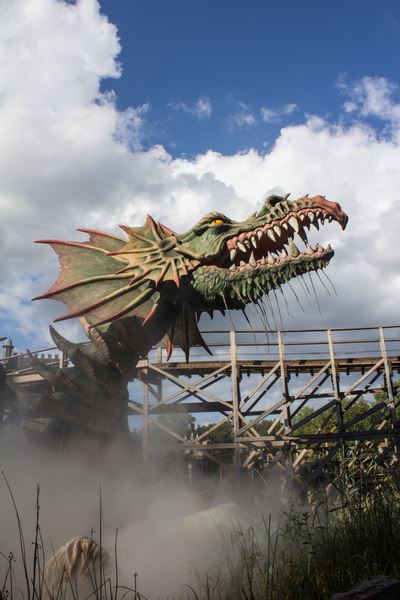 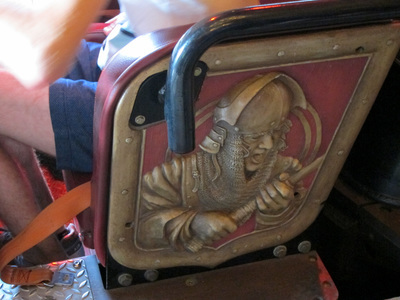 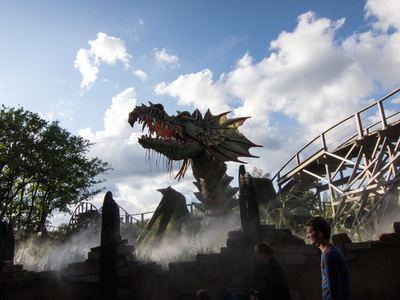 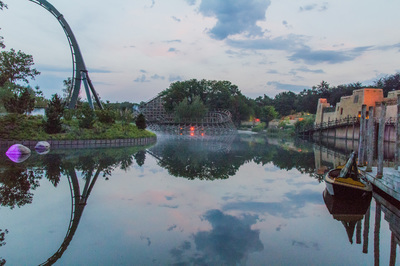 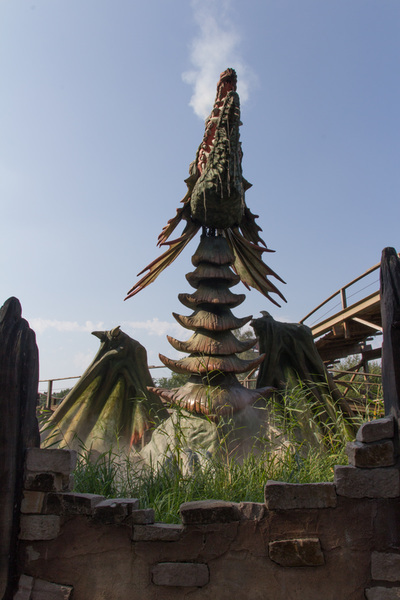 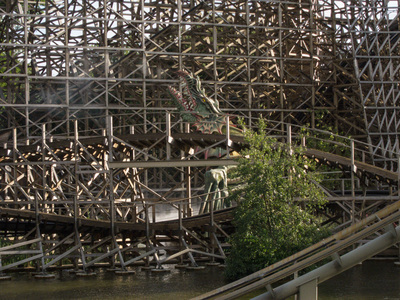 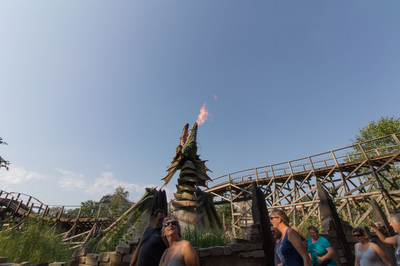 Come to the Efteling and fight against the dragon and against each other in the new wooden rollercoaster racer Joris en de Draak. 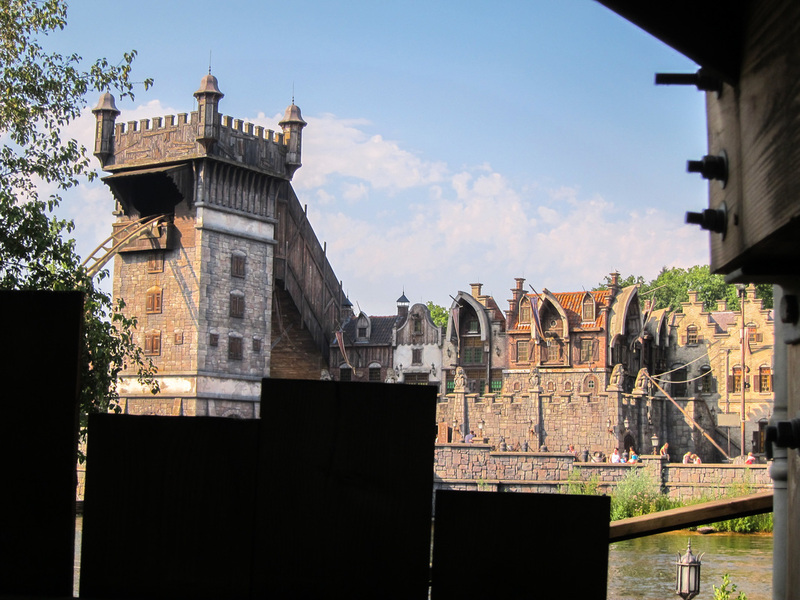 Follow in the footsteps of the legendary Joris, who cleverly beat the dragon! 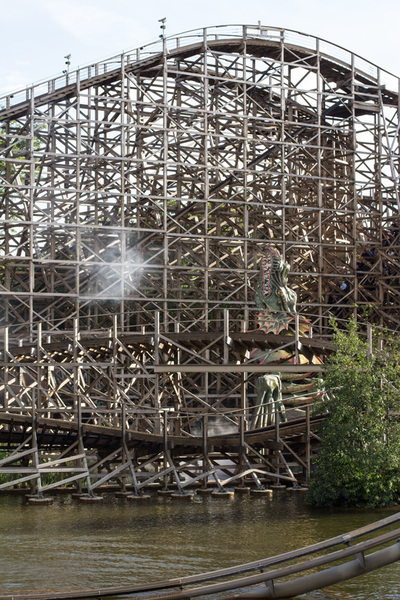 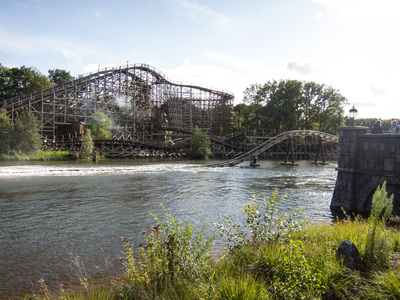 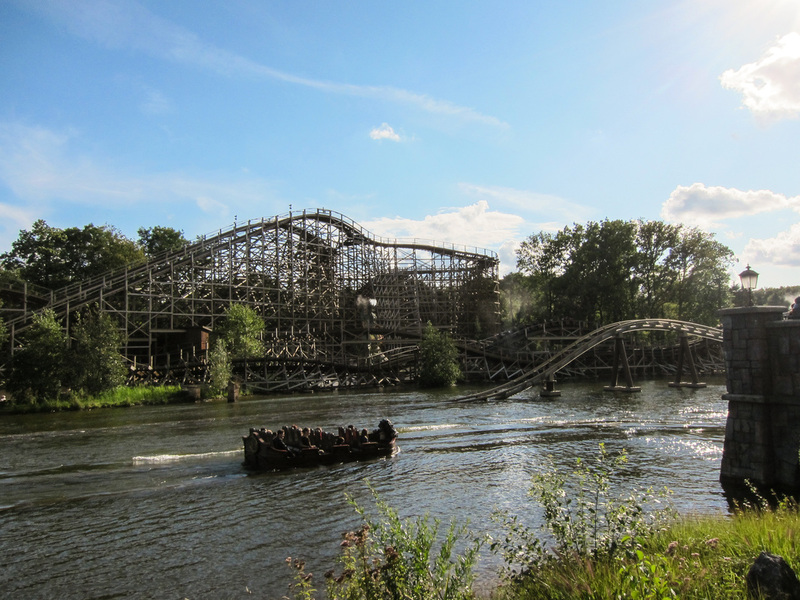 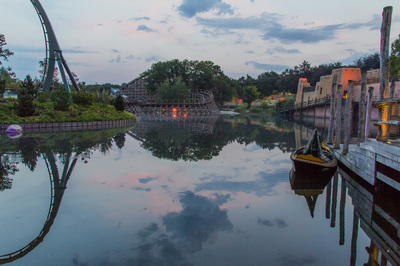 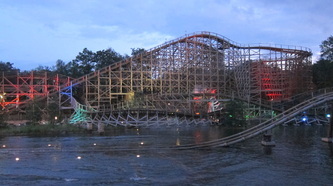 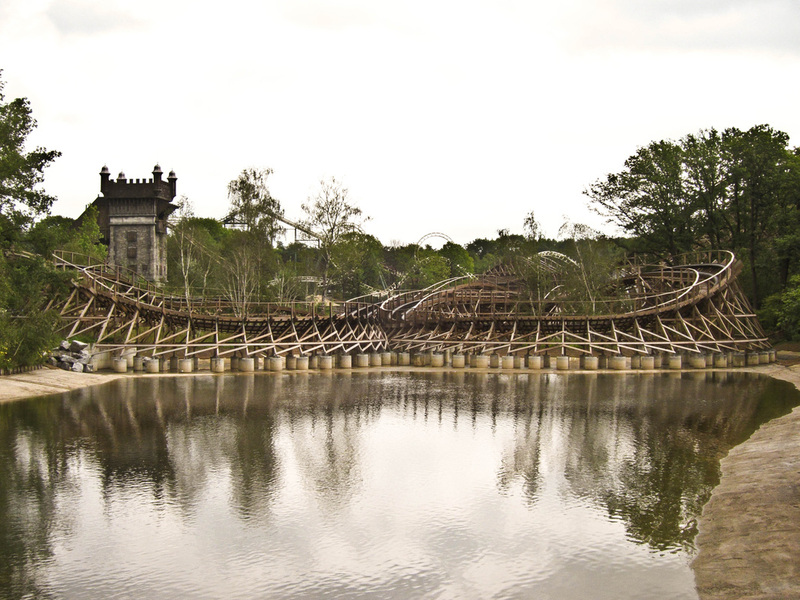 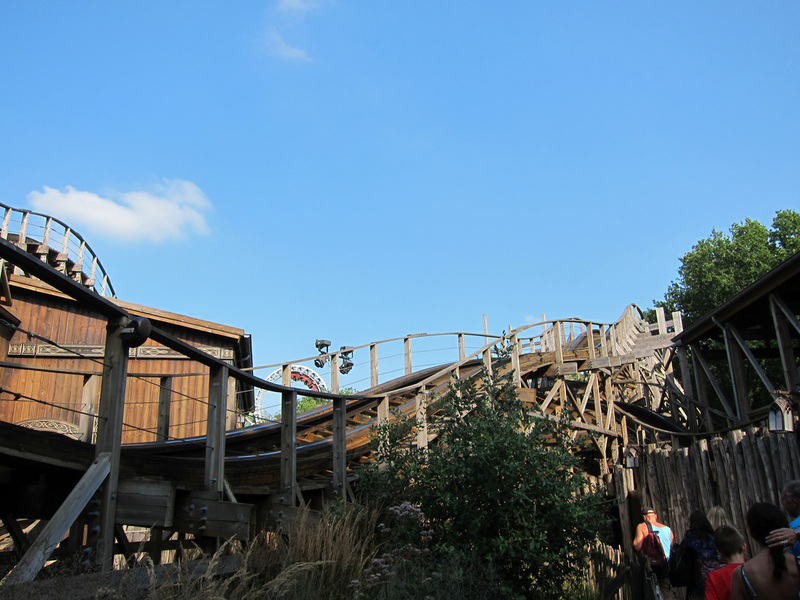 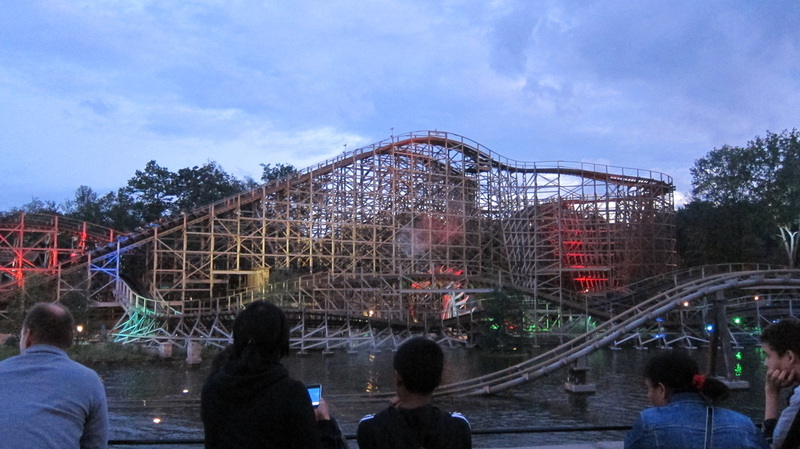 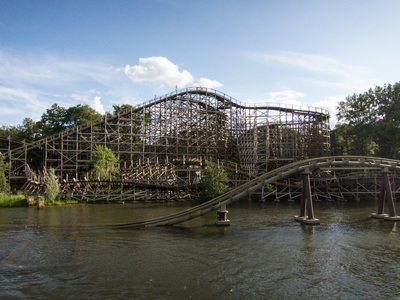 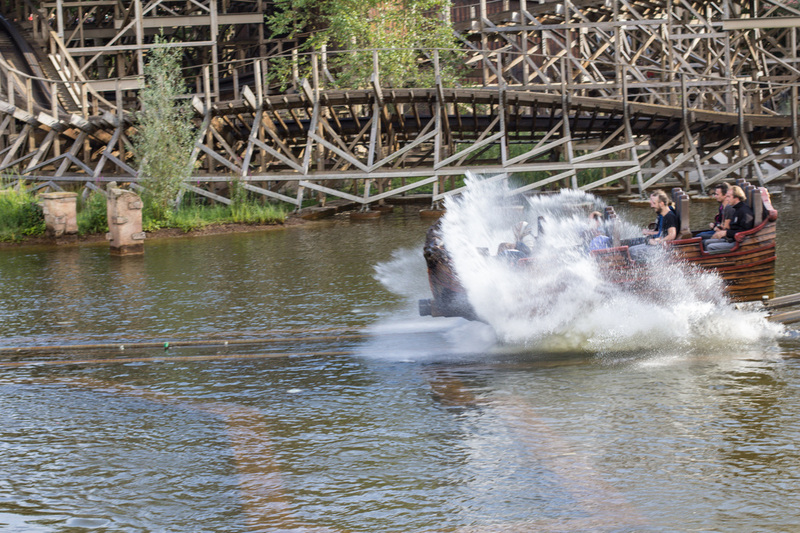 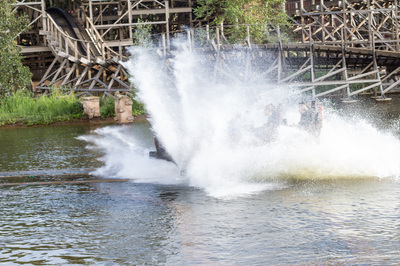 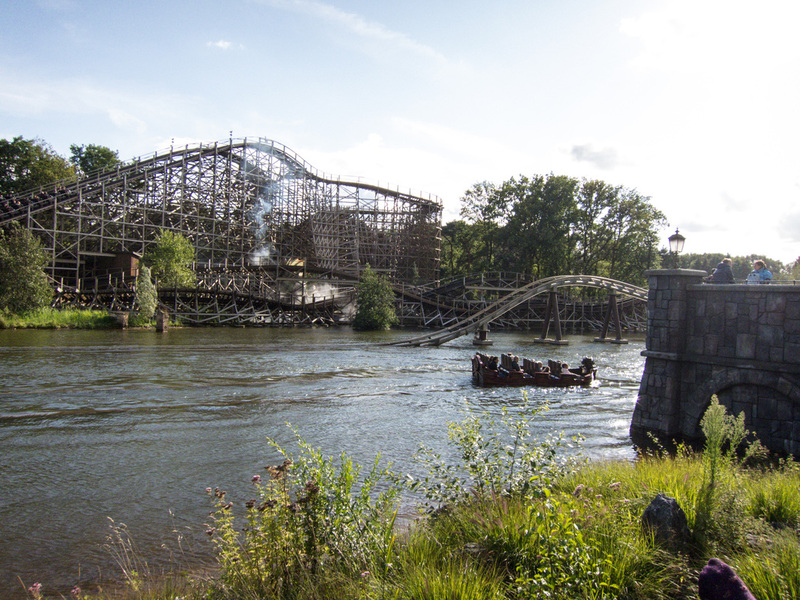 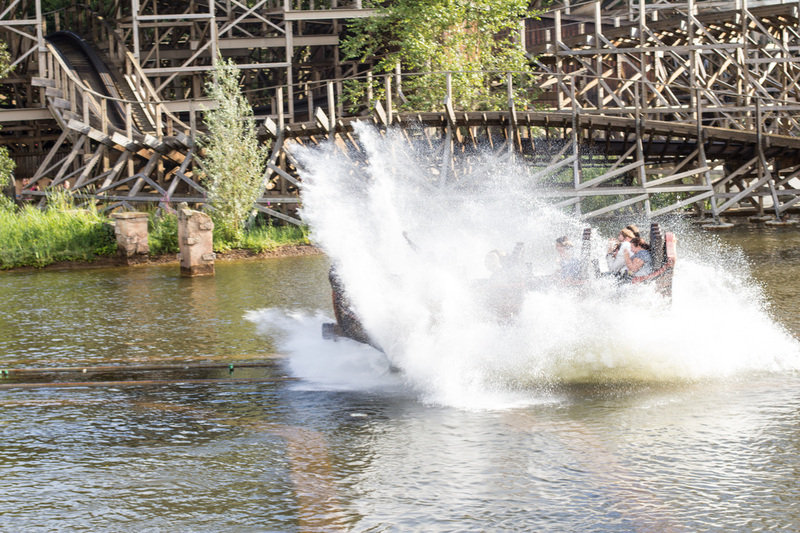 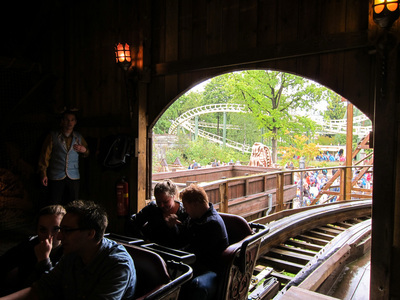 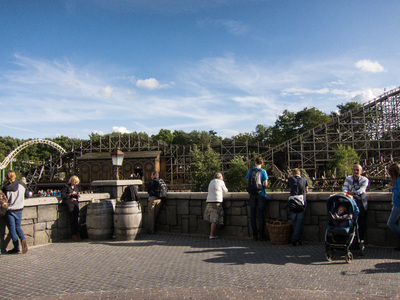 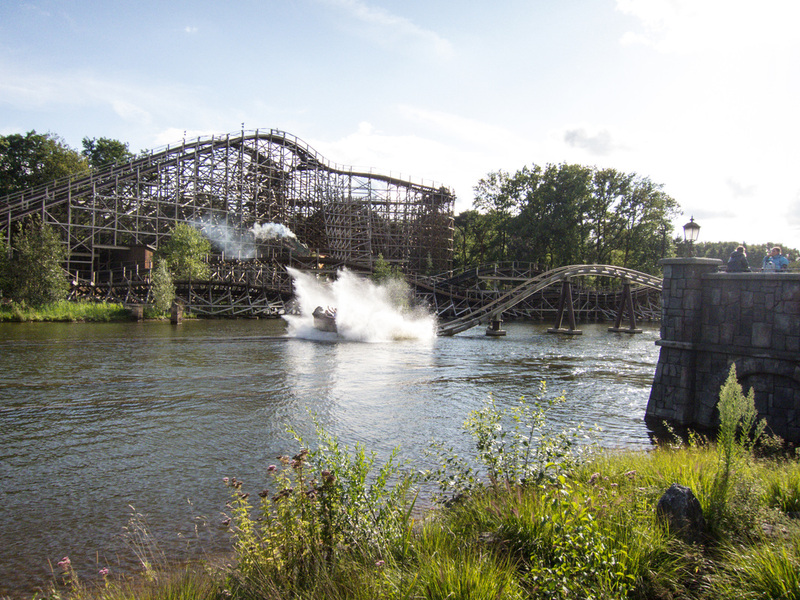 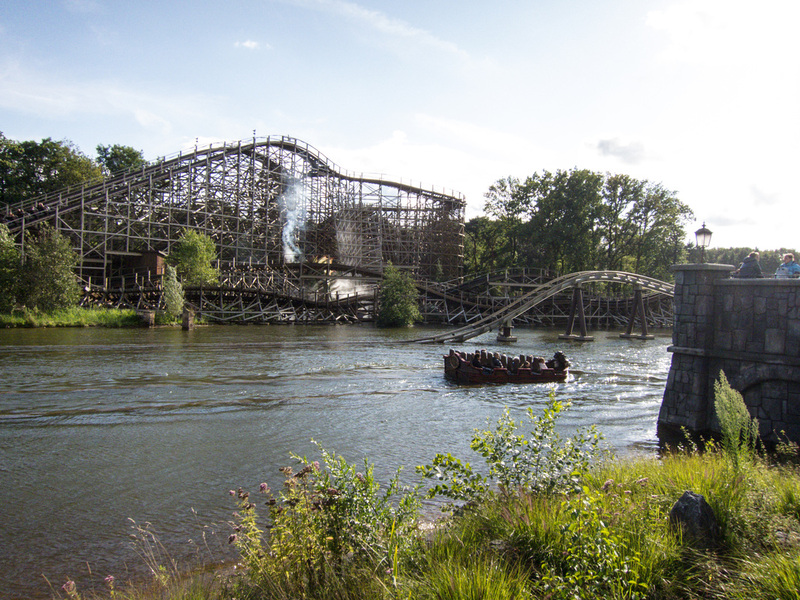 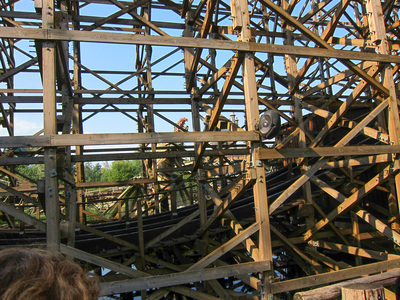 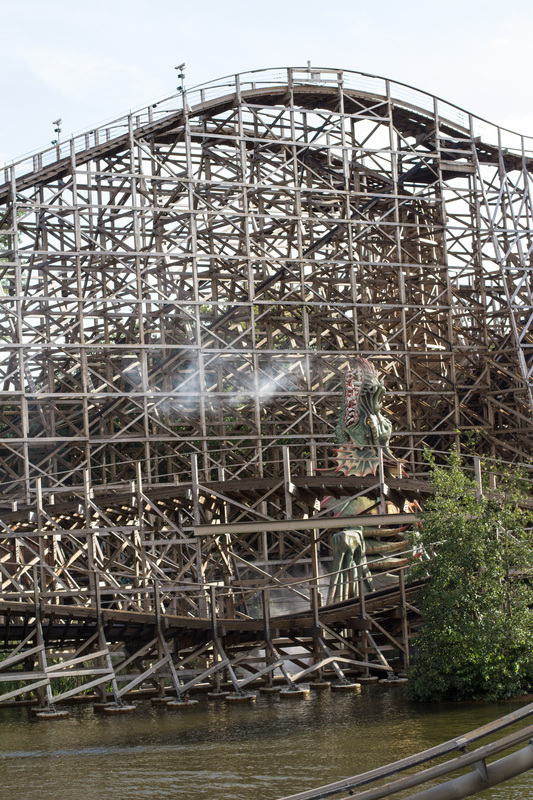 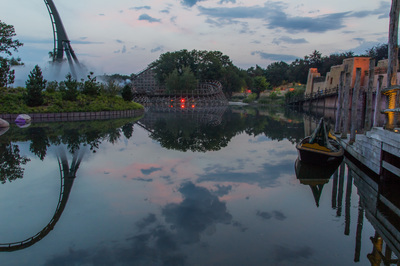 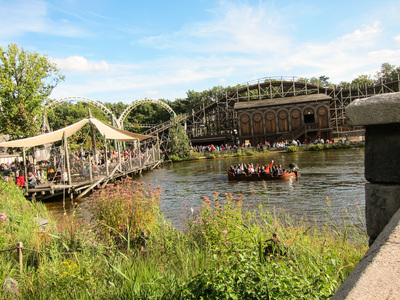 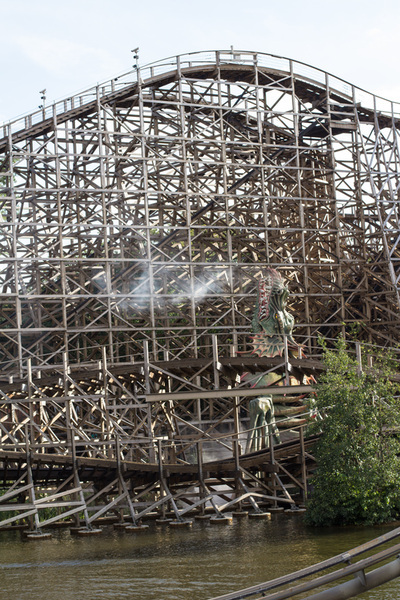 In this double, wooden racer rollercoaster the visitors are divided accross two tracks: water and fire. 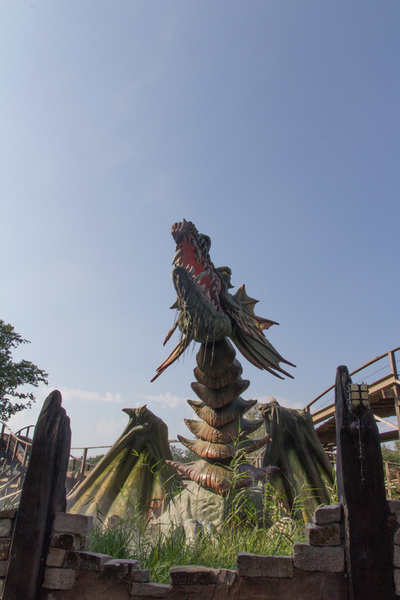 You race each other for the fastest time while listening to the terrifying roars of the dragon. 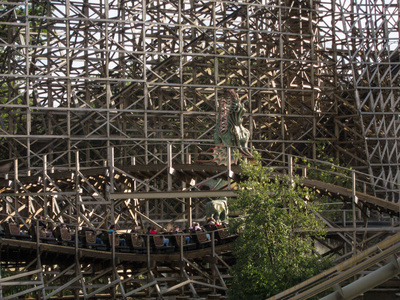 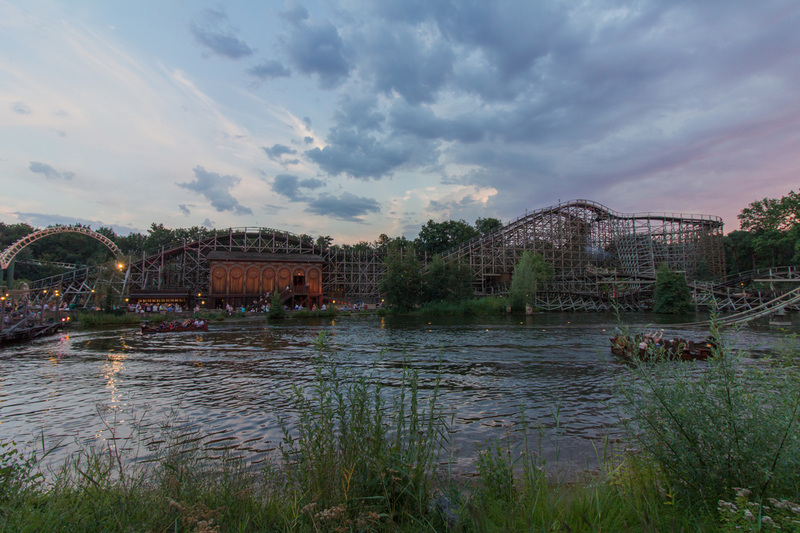 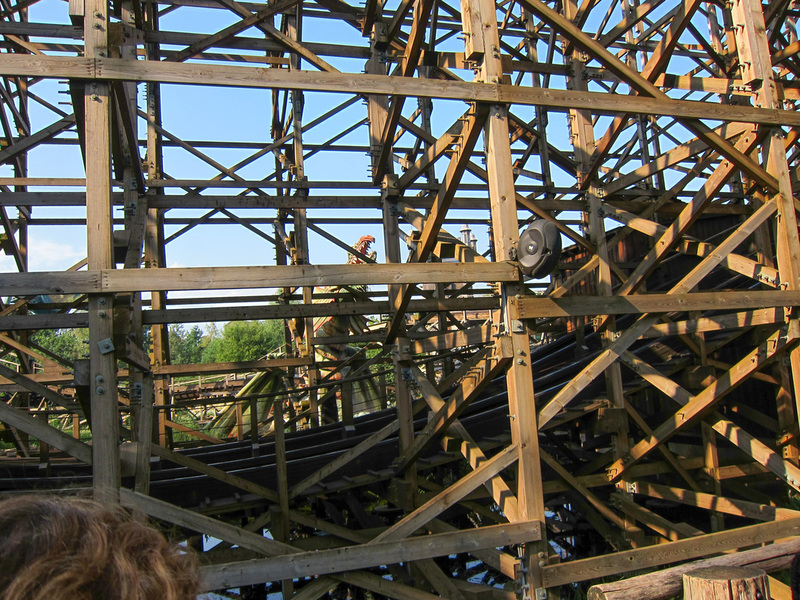 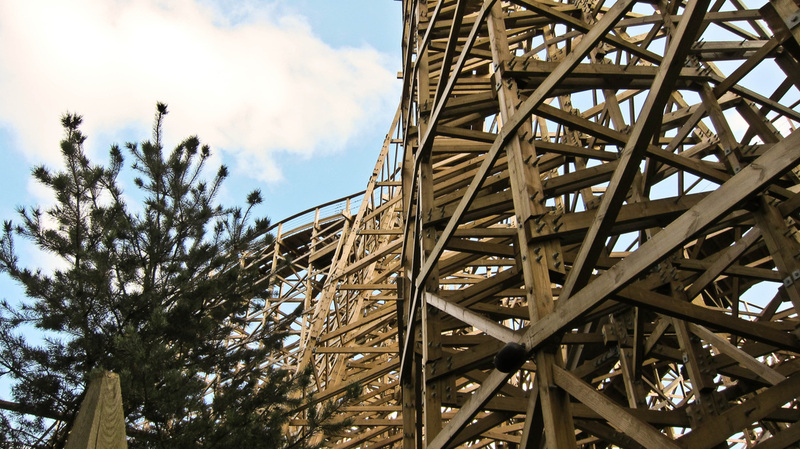 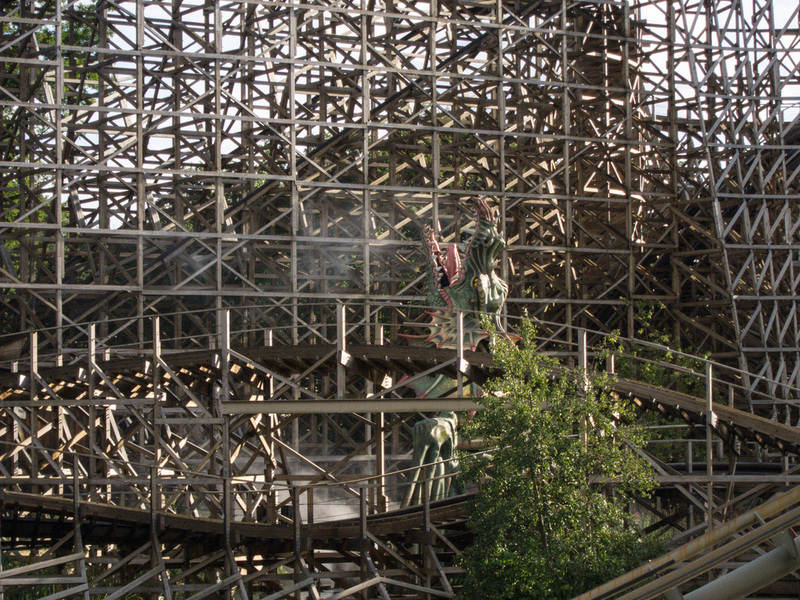 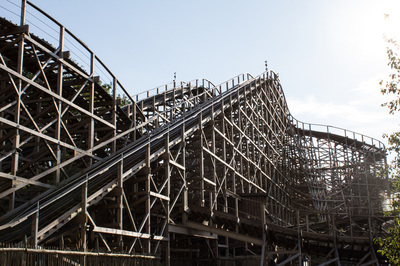 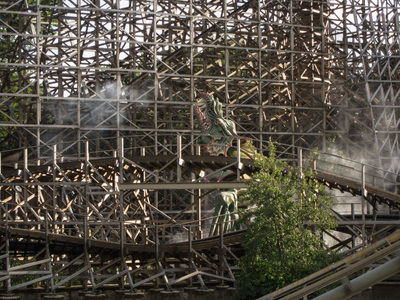 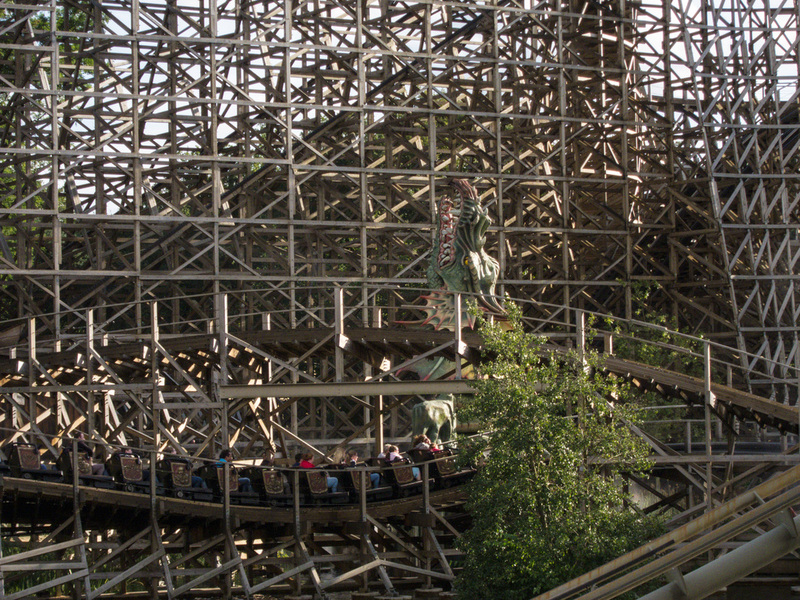 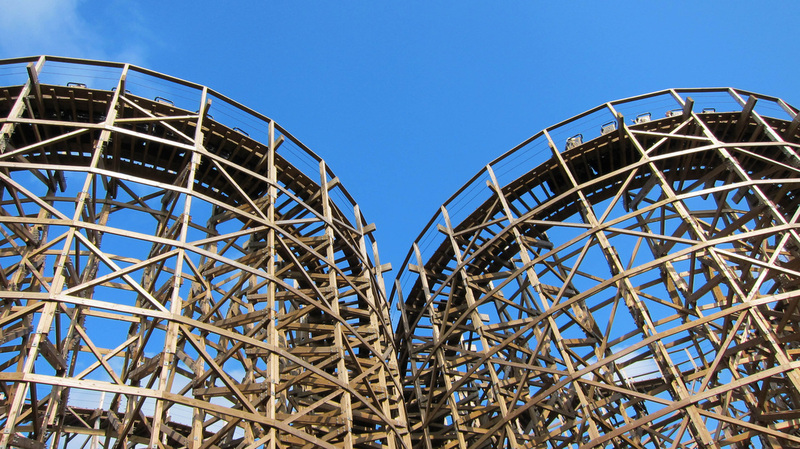 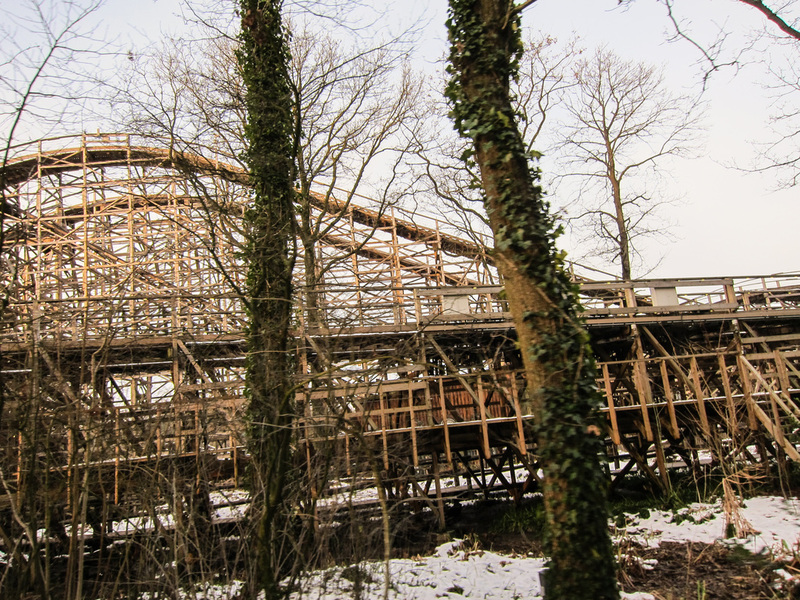 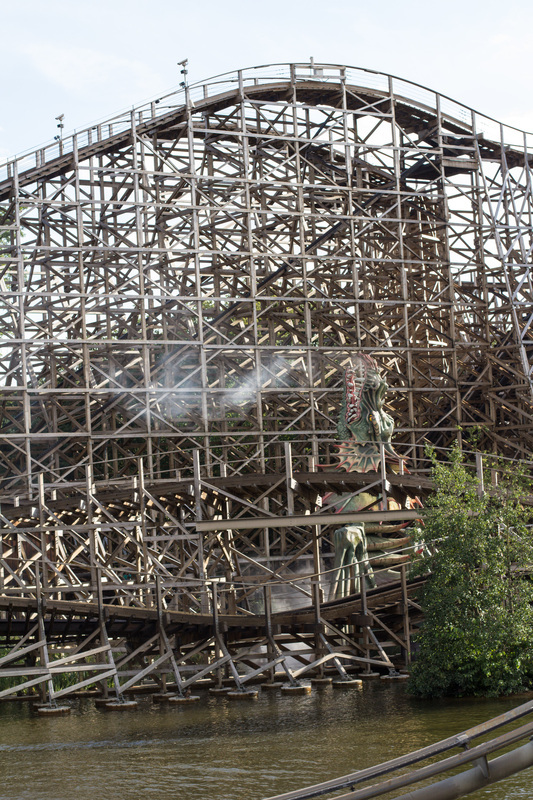 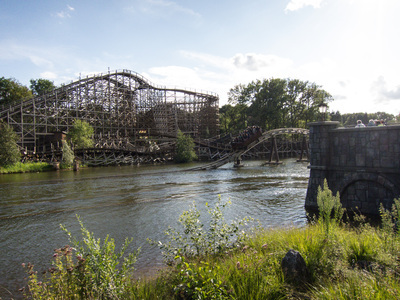 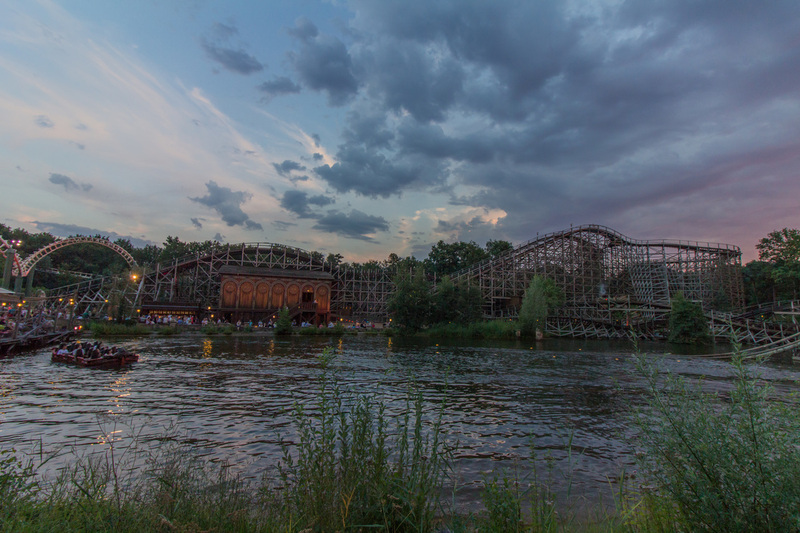 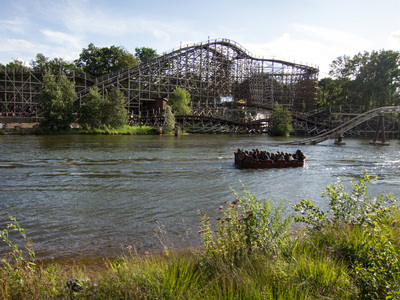 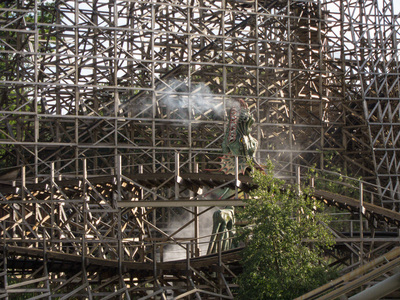 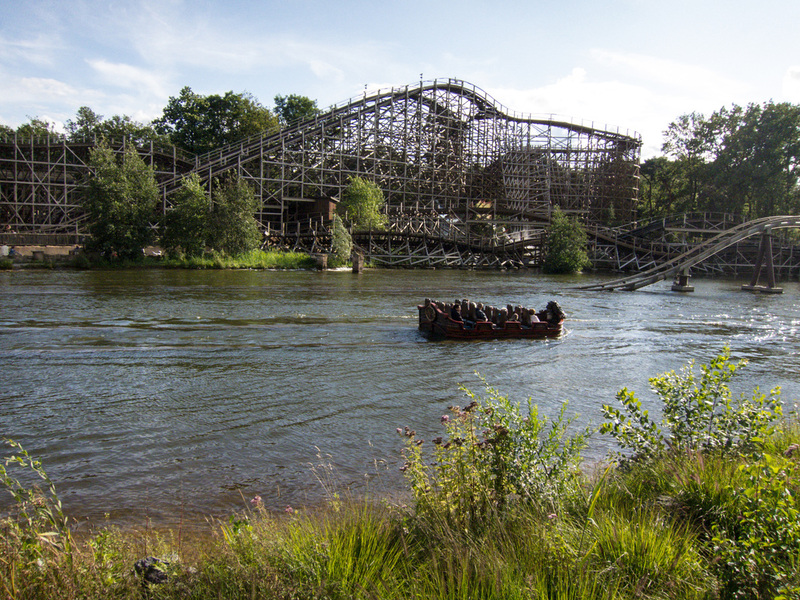 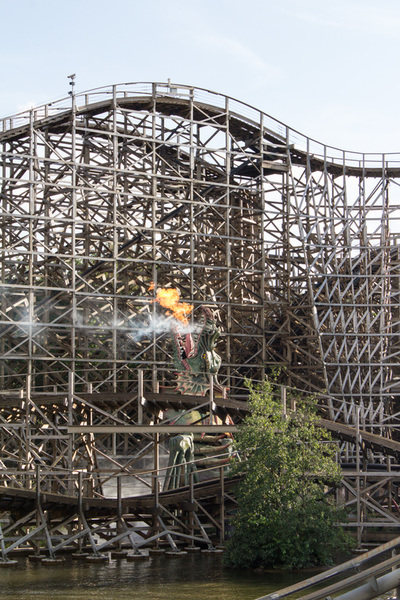 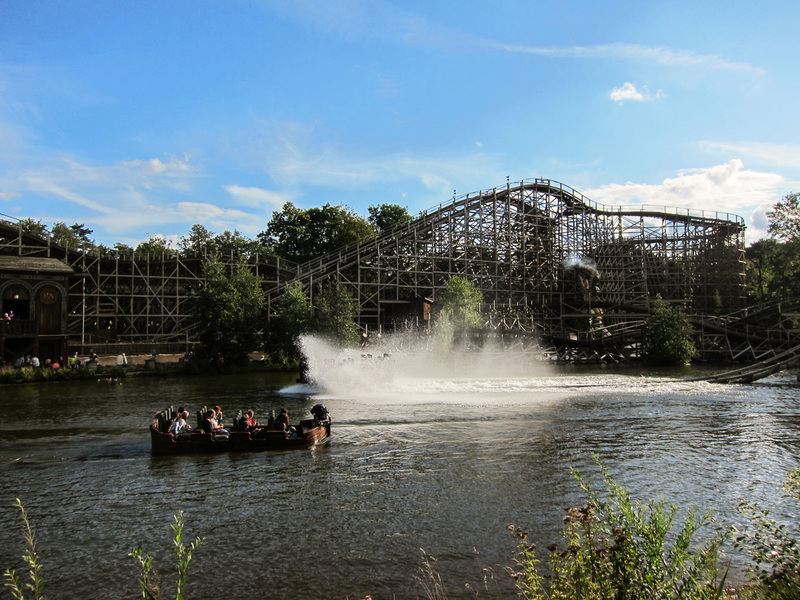 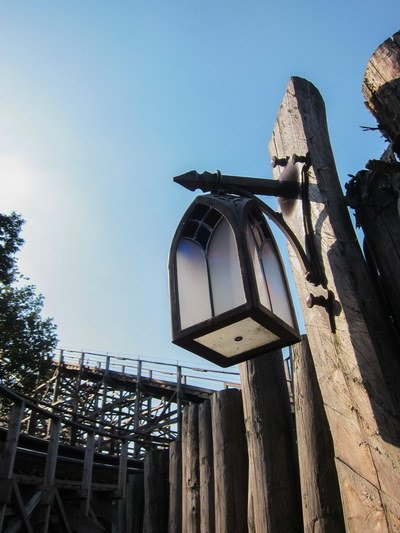 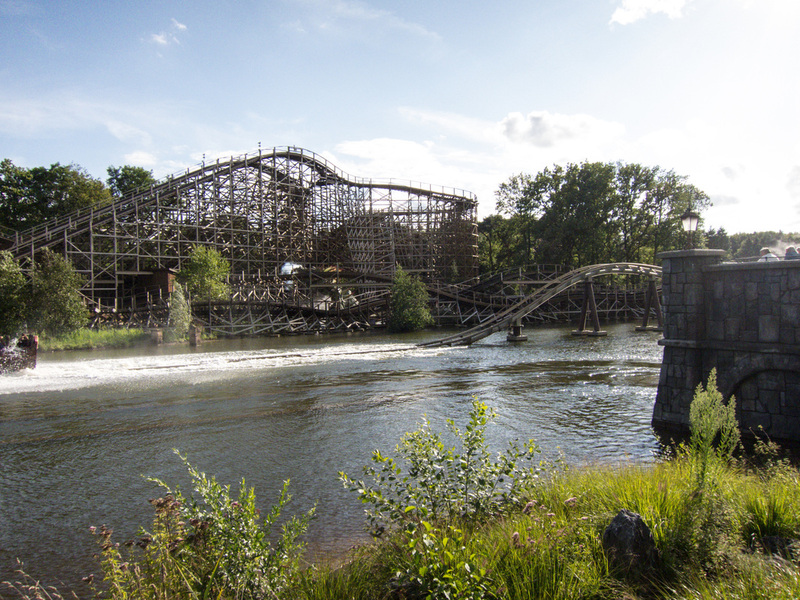 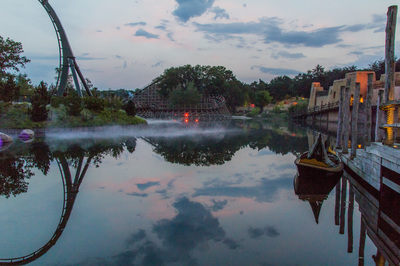 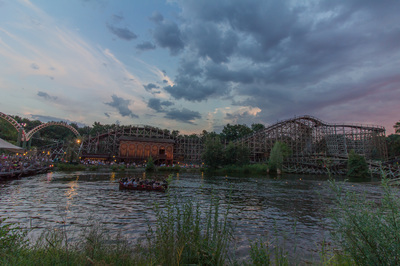 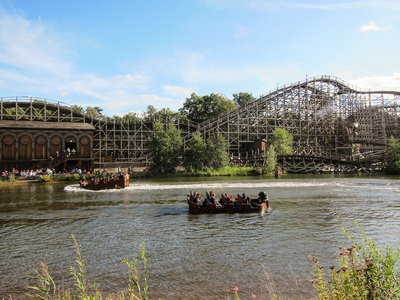 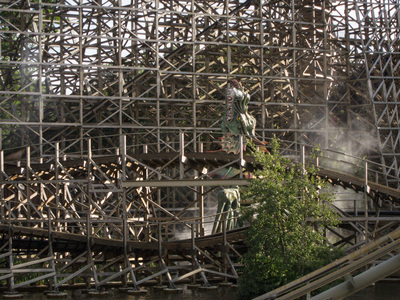 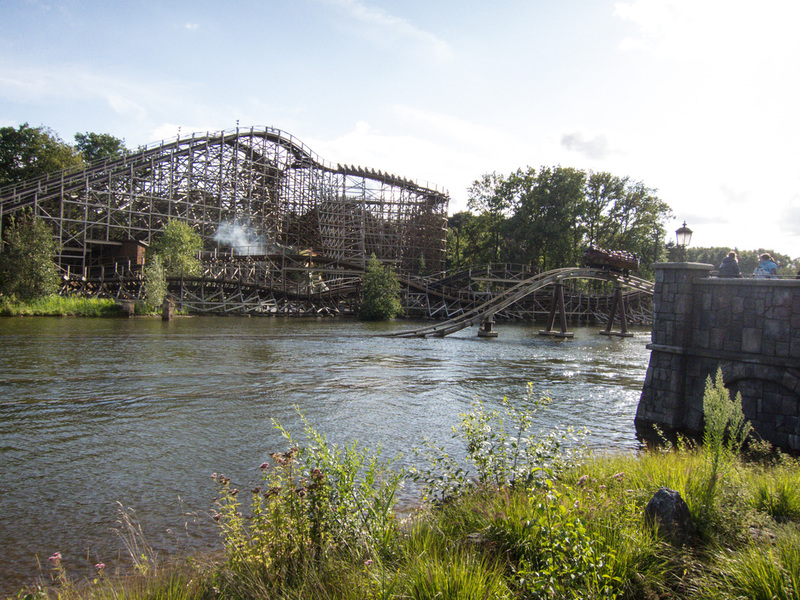 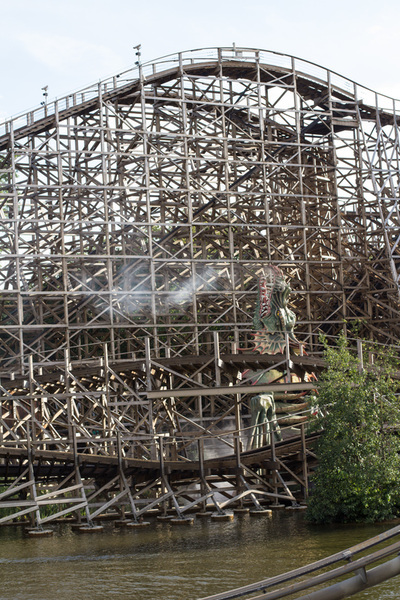 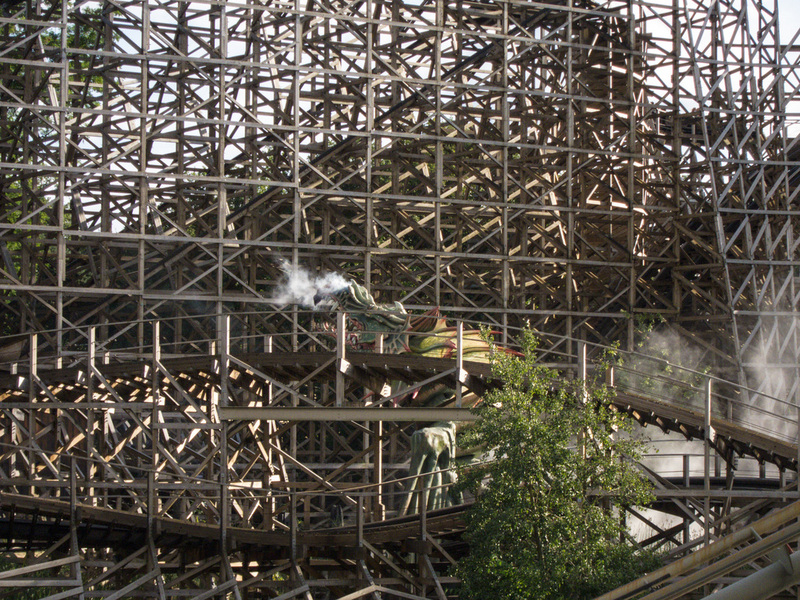 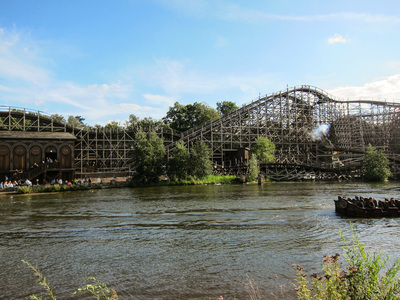 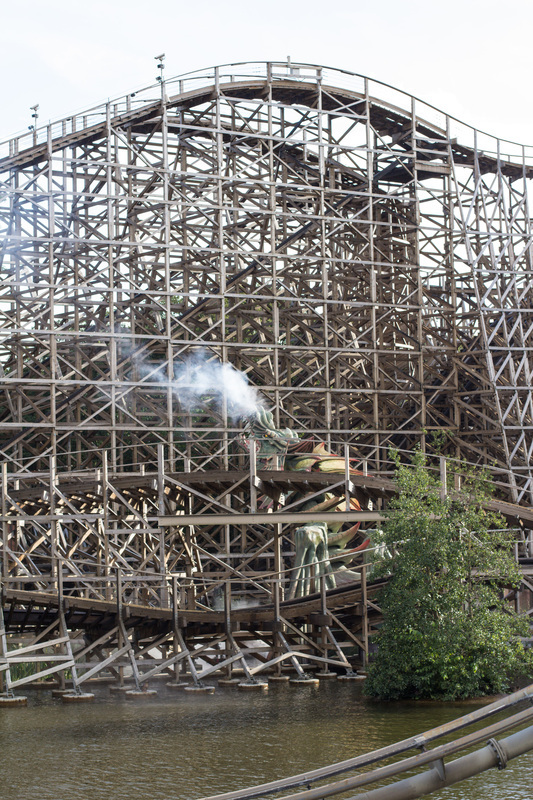 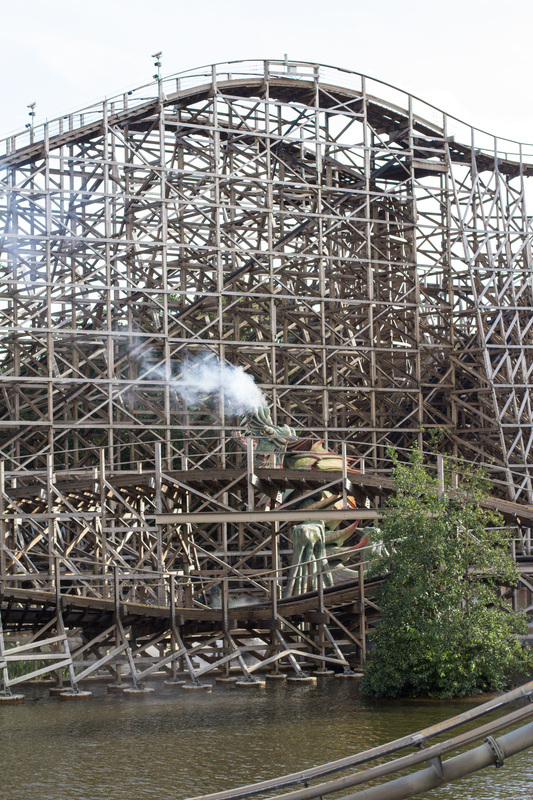 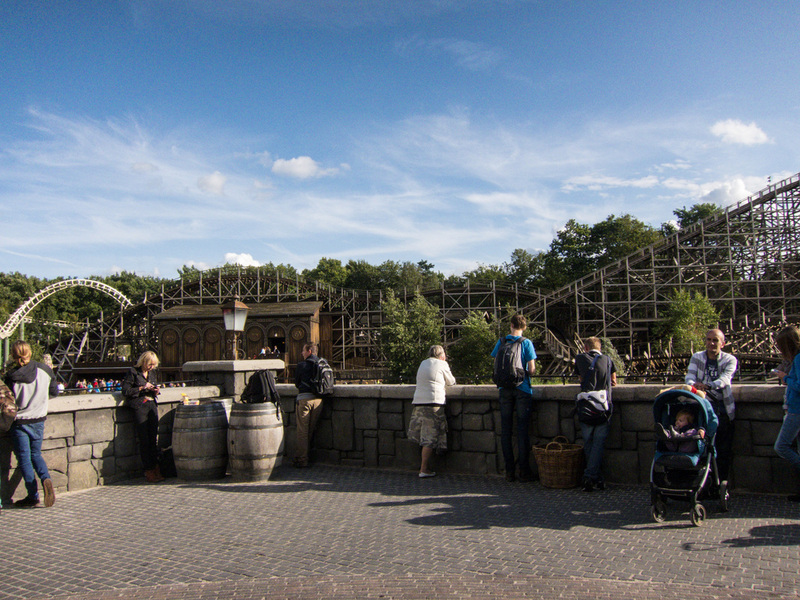 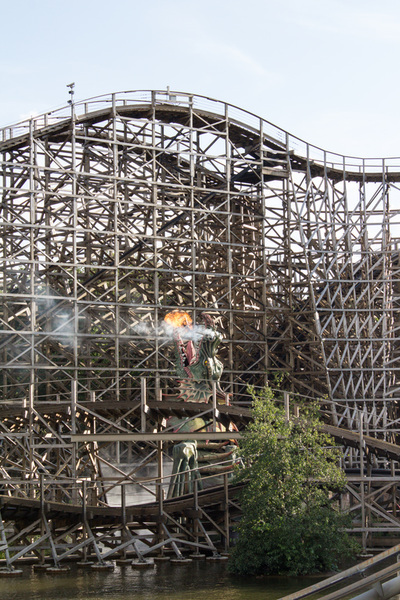 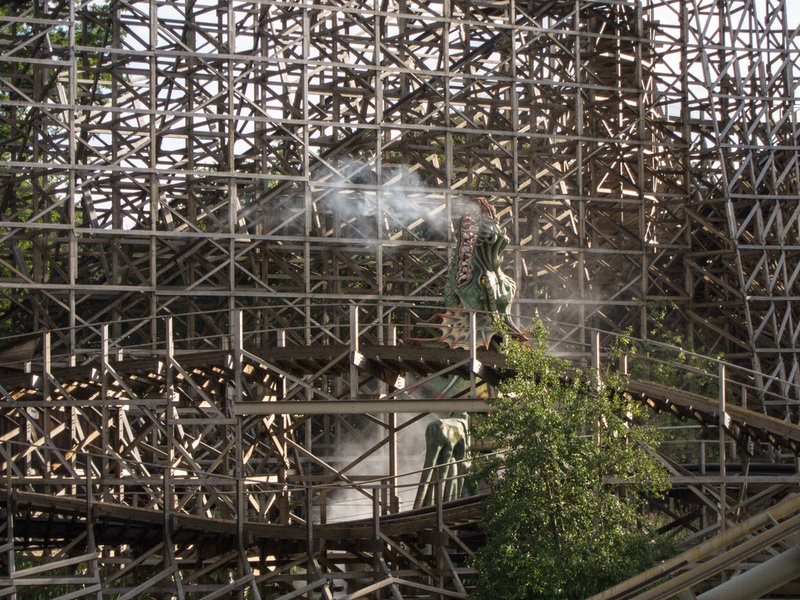 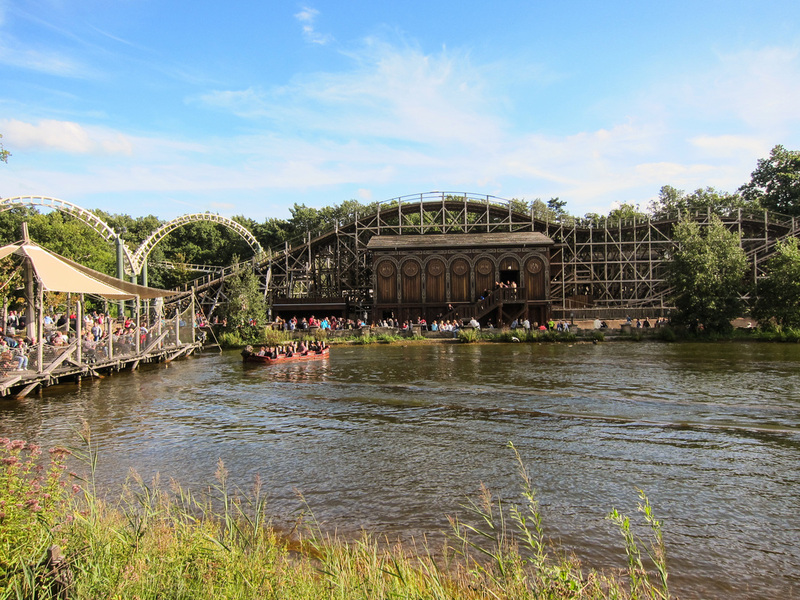 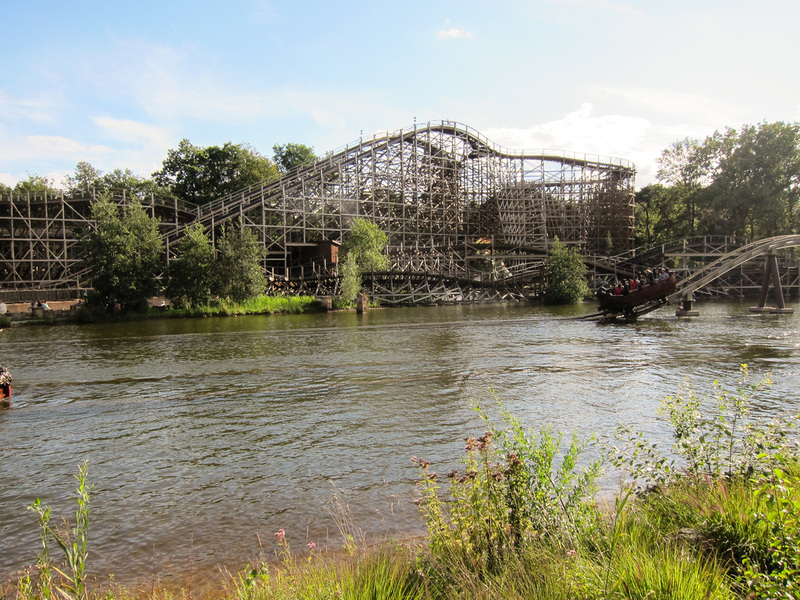 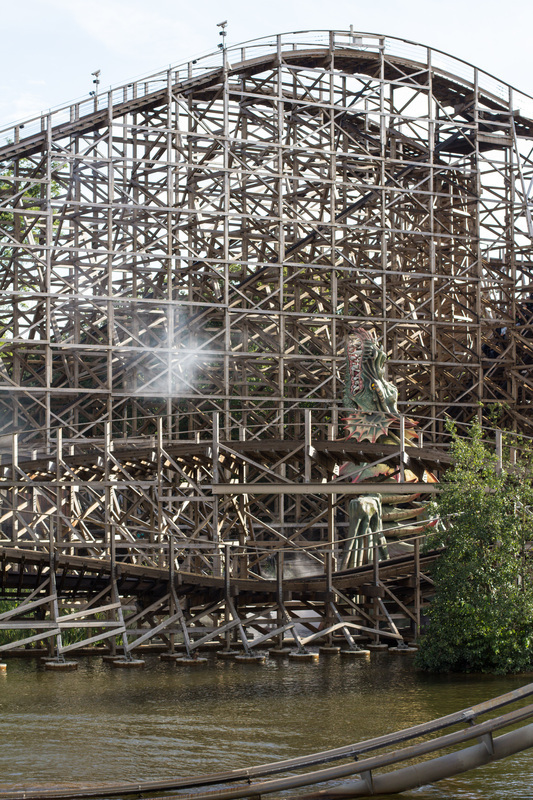 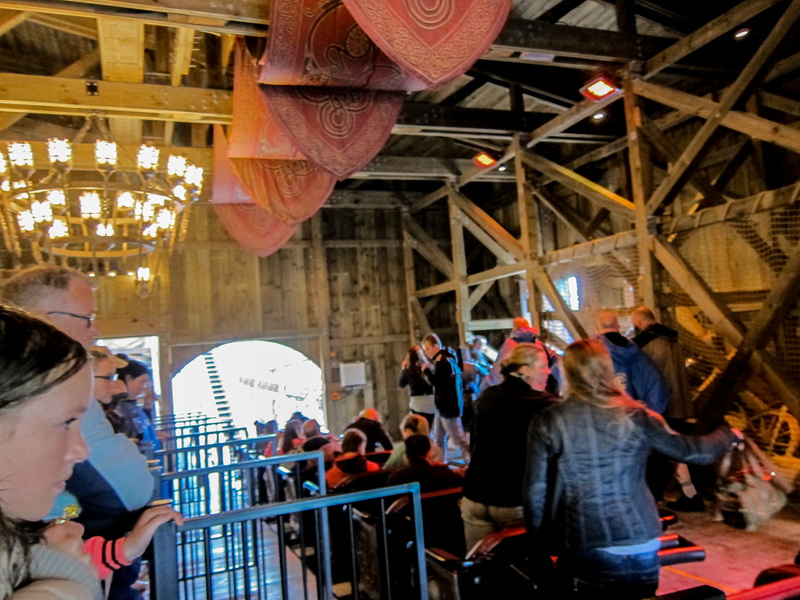 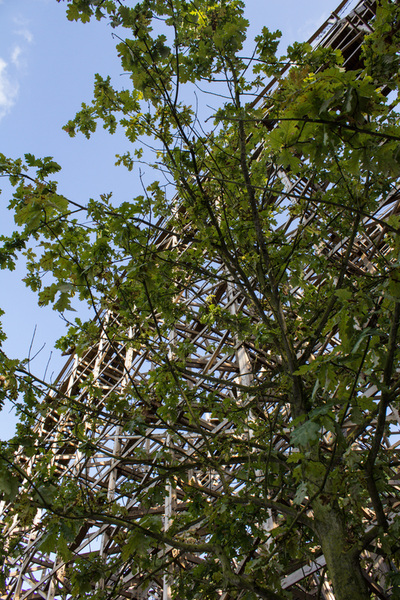 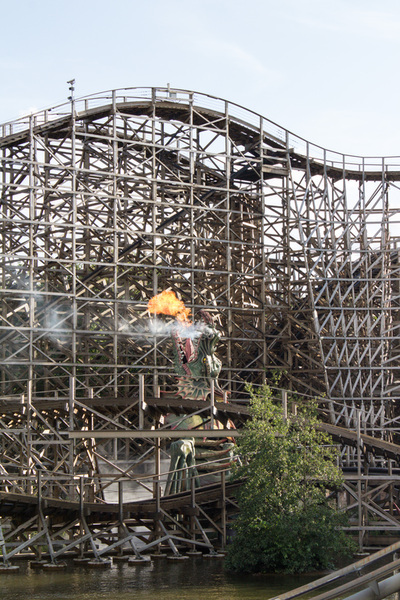 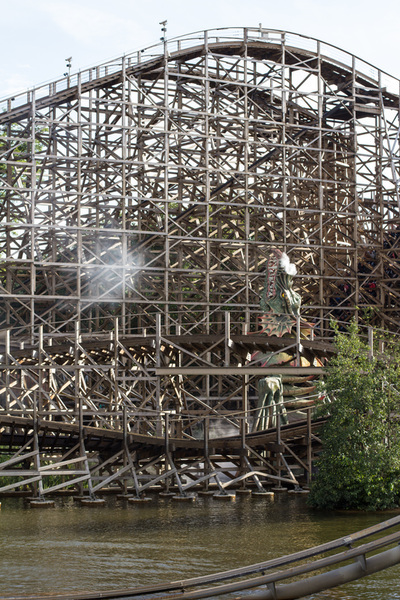 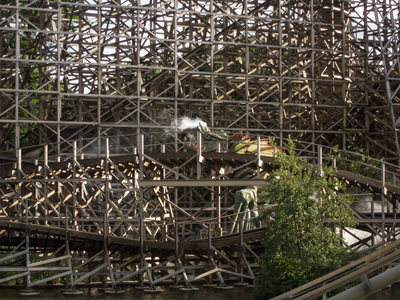 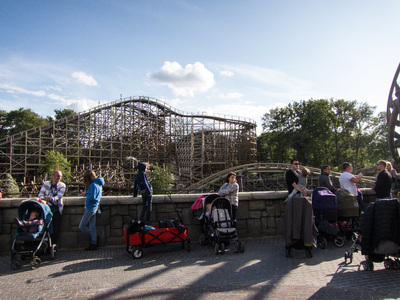 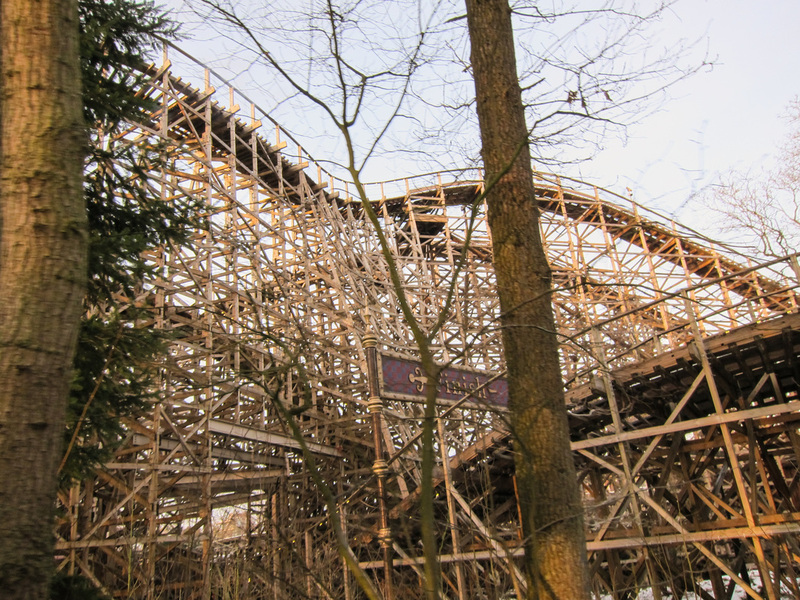 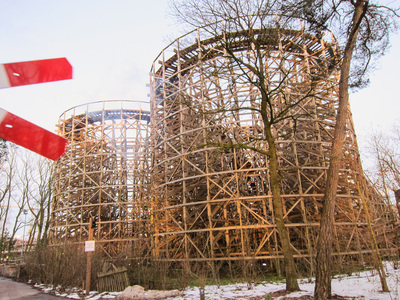 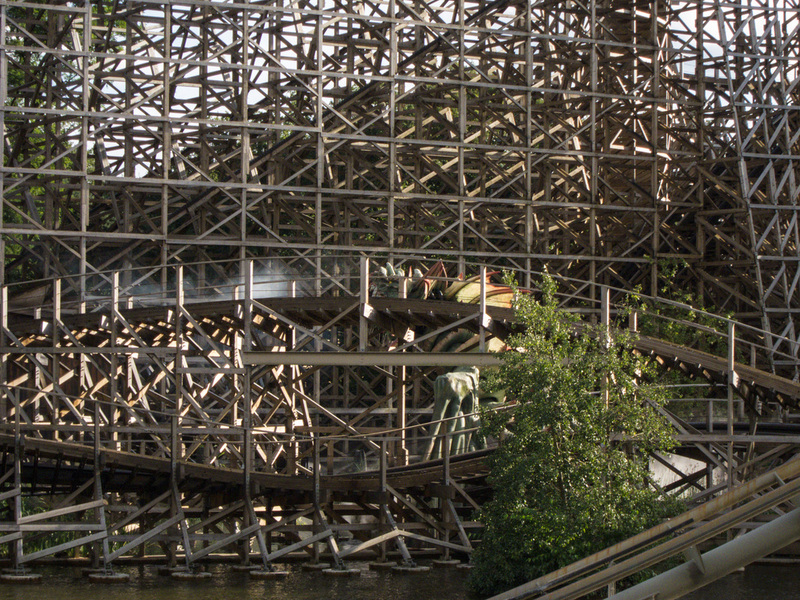 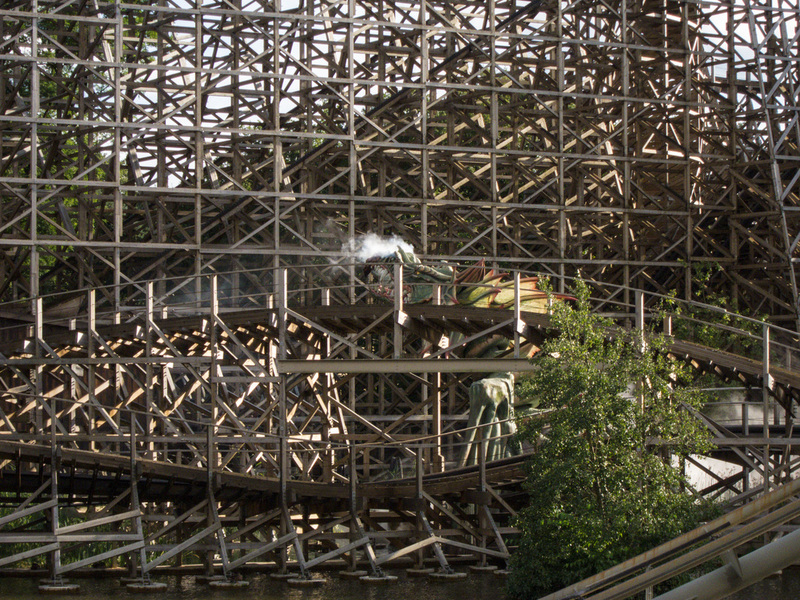 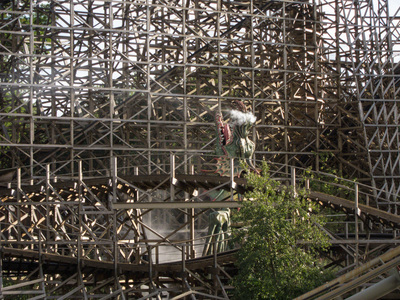 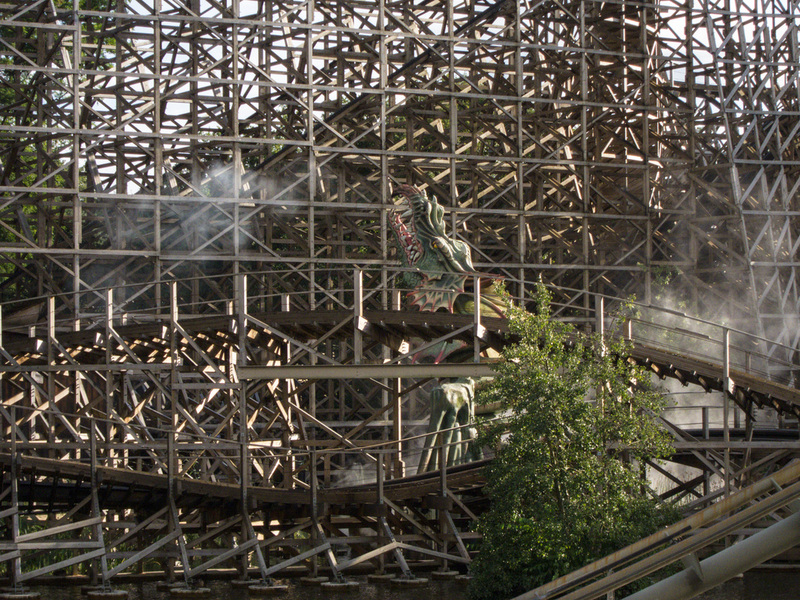 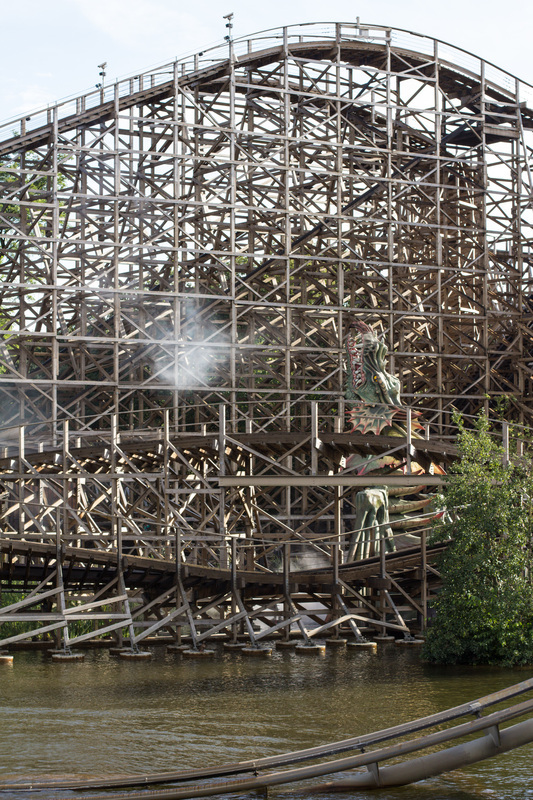 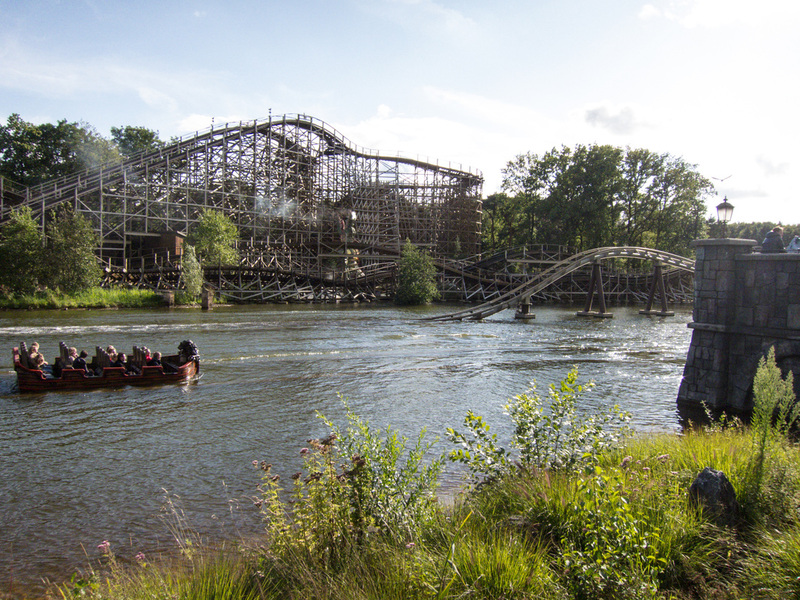 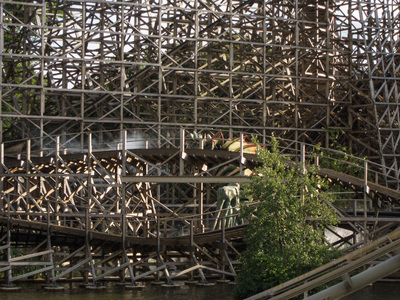 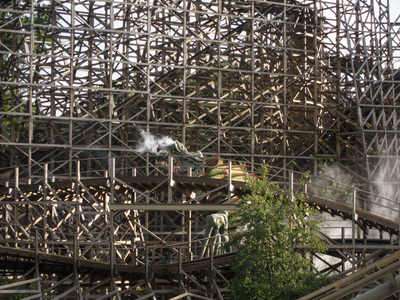 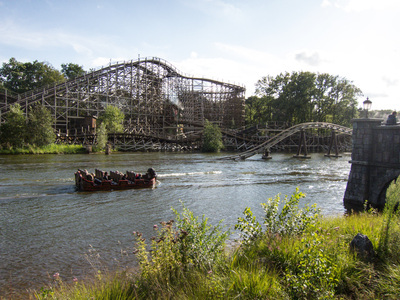 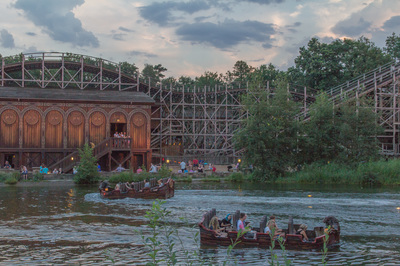 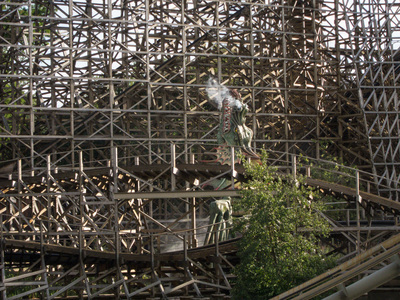 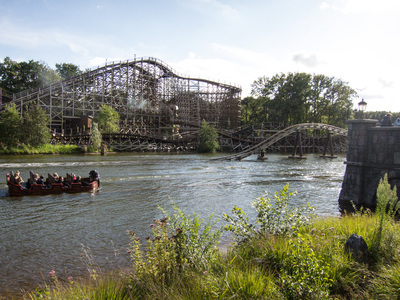 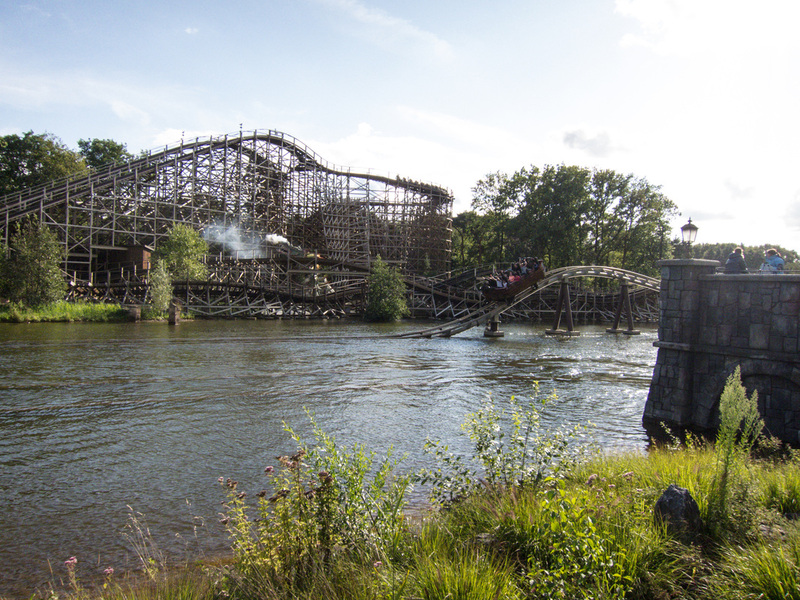 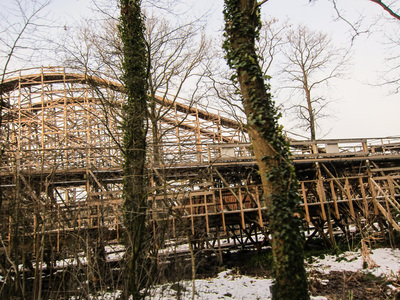 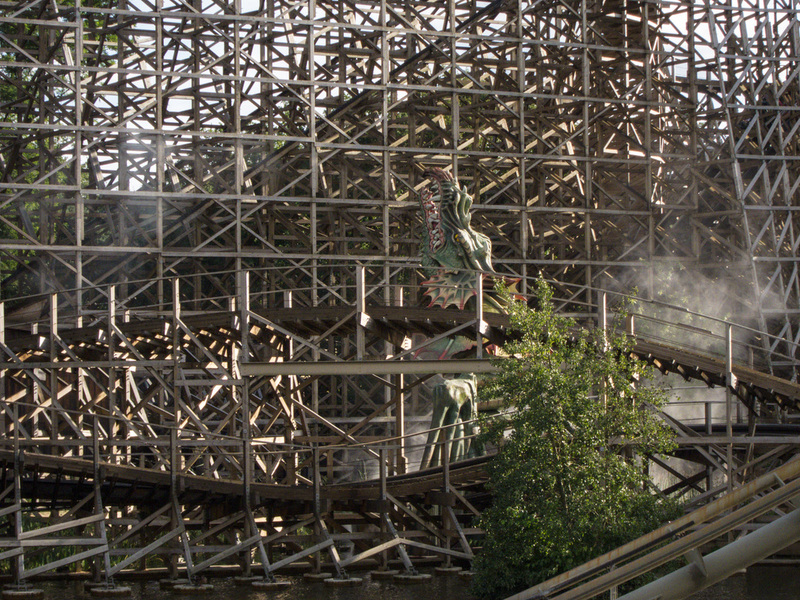 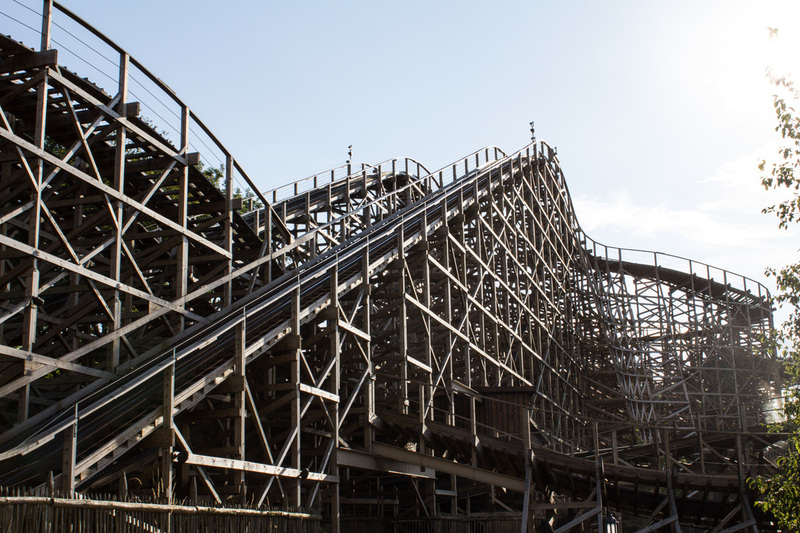 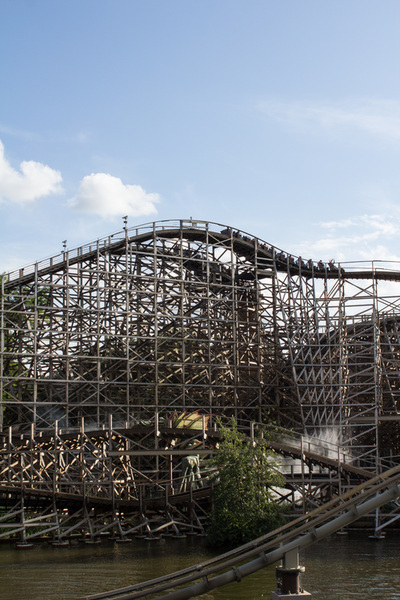 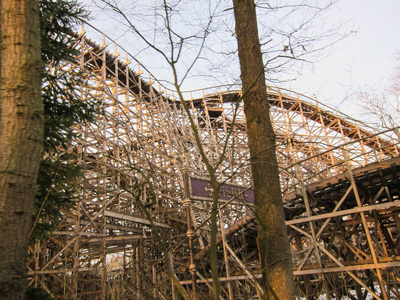 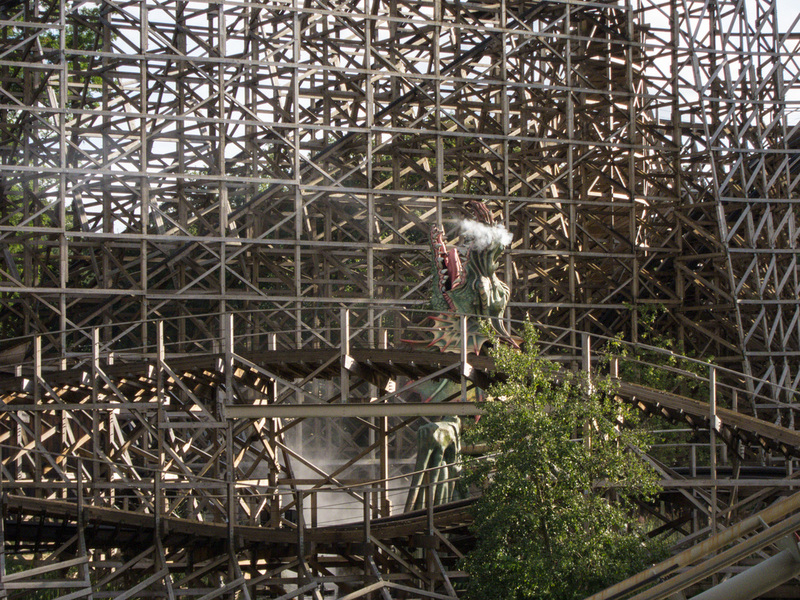 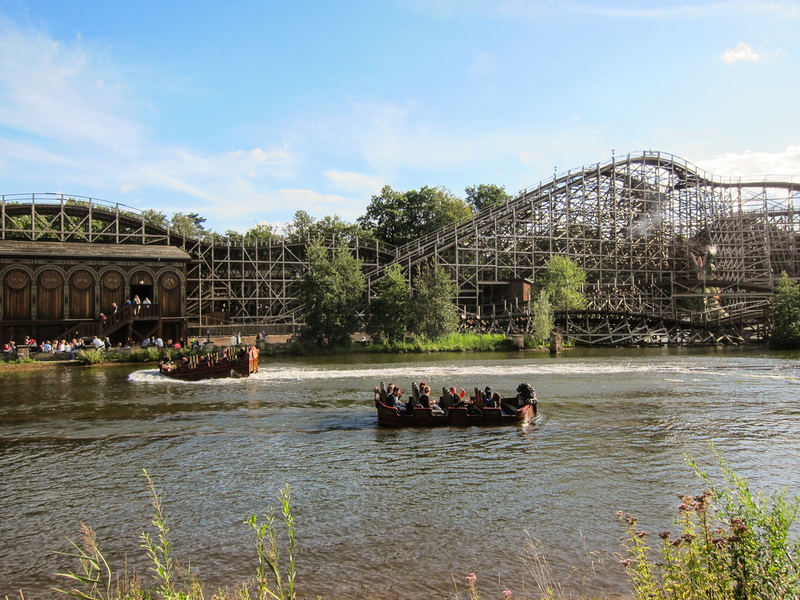 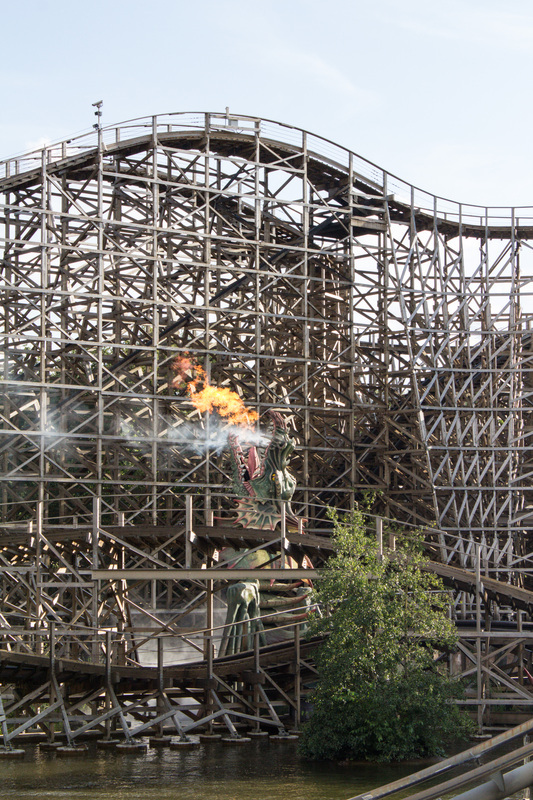 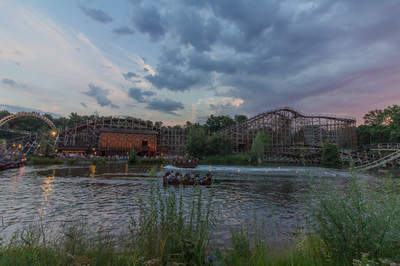 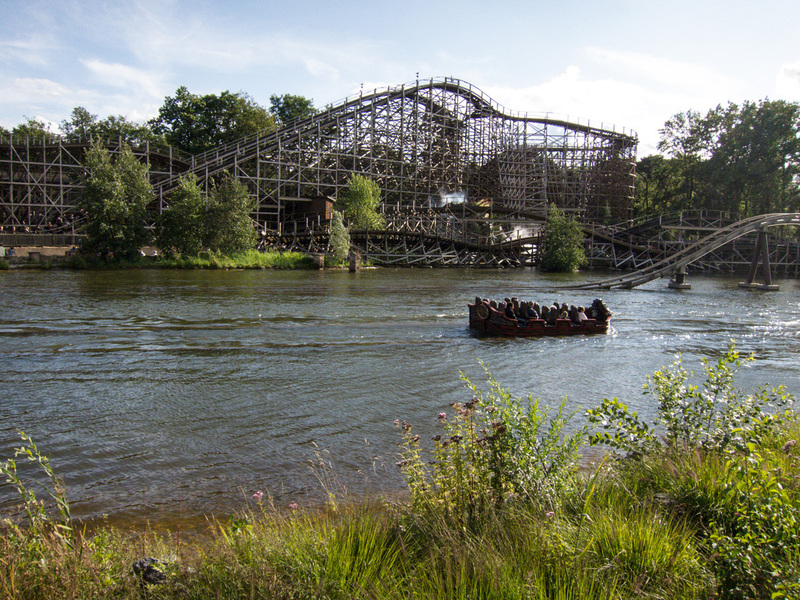 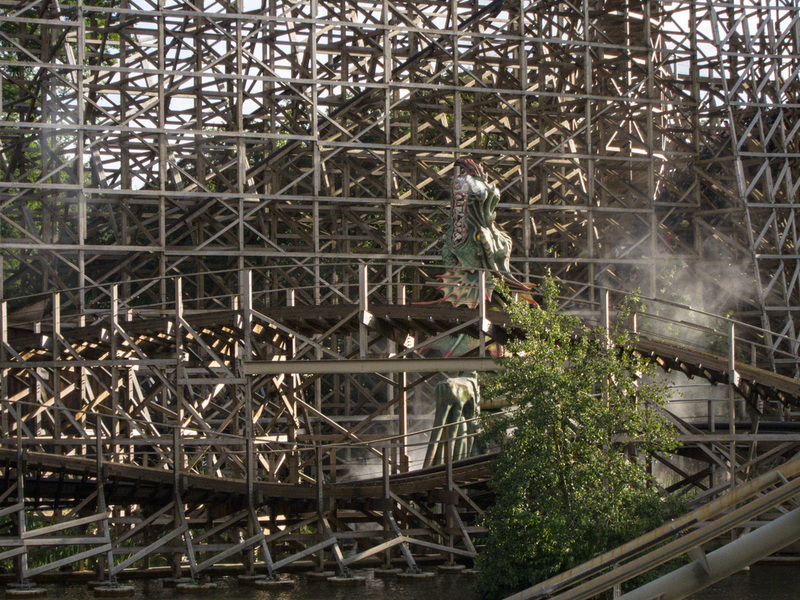 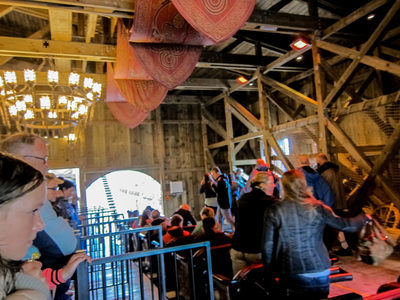 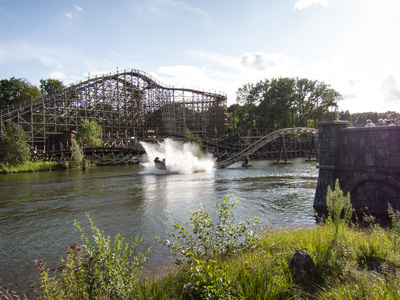 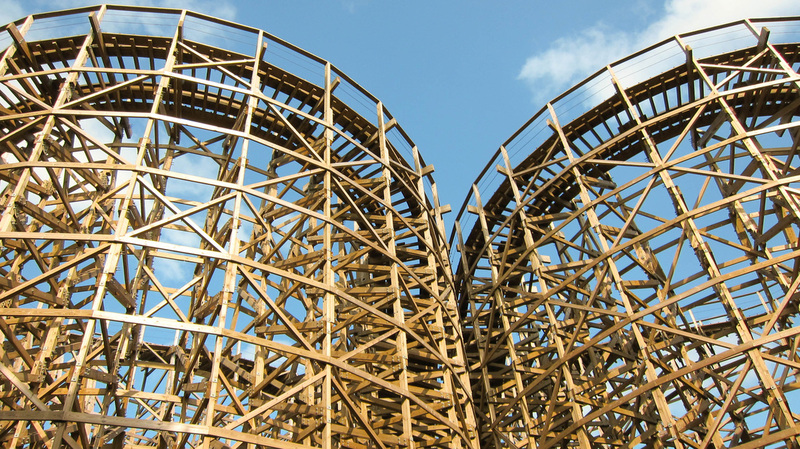 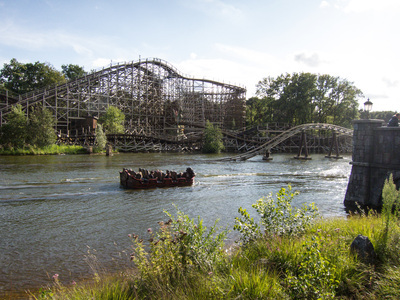 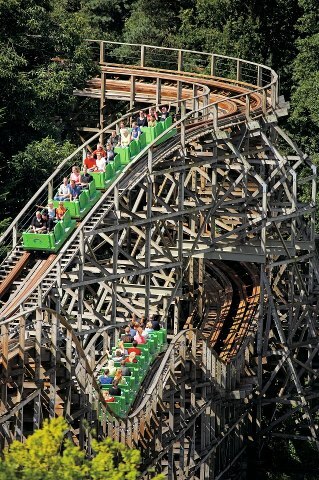 Joris en de Draak is the first wooden racer roller coaster in North-west Europe. 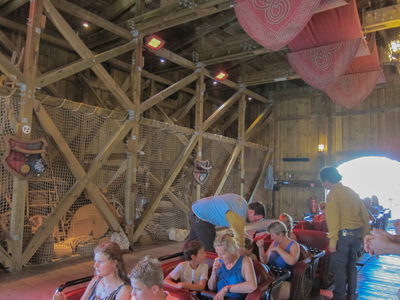 The roller coaster has a capacity of 1.750 people per hour. Both tracks are 810 meters long and the maximum speed is 75 km per hour. 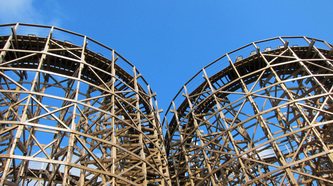 The highest point of the roller coaster is 25 meters. 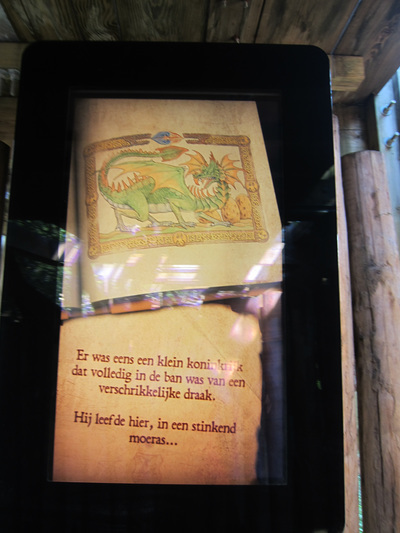 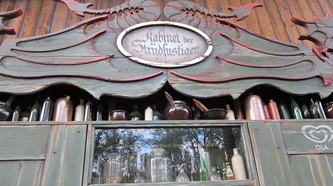 *Joris en de Draak is not opened during the Winter Efteling if it freezes. 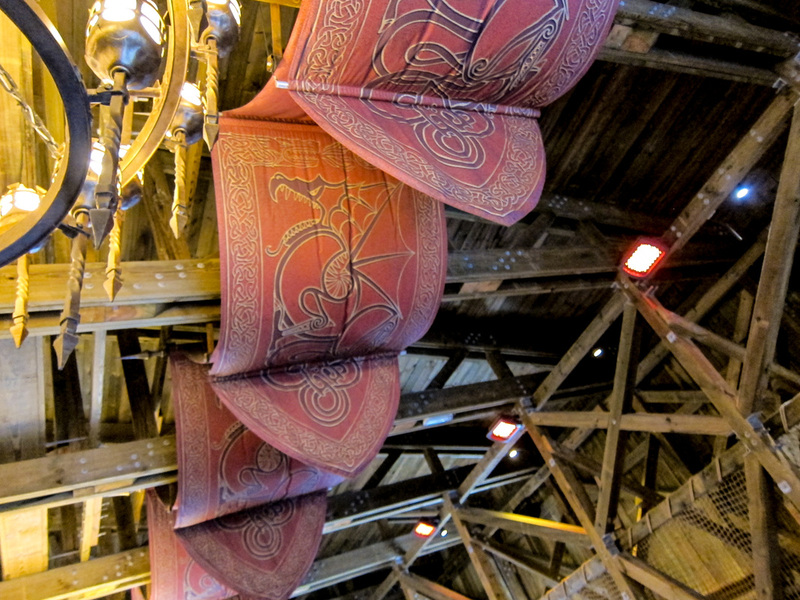 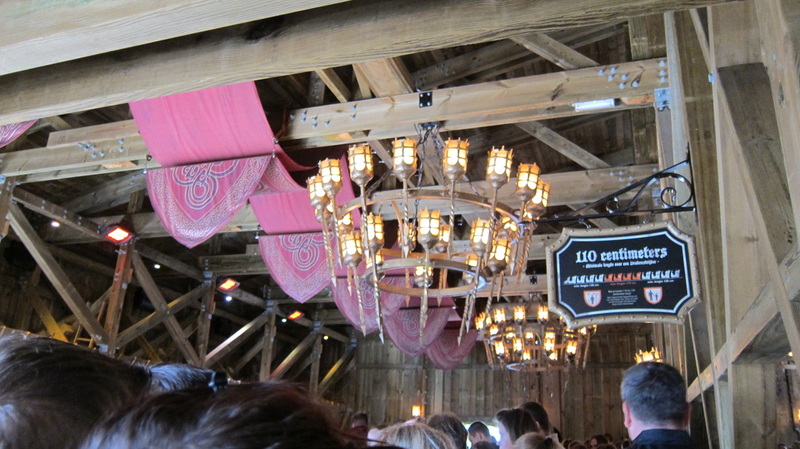 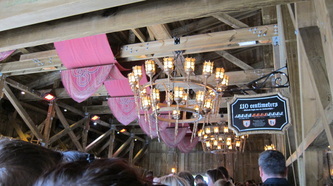 You can buy George and the Dragon themed items at the Efteling Souvenir Shop! 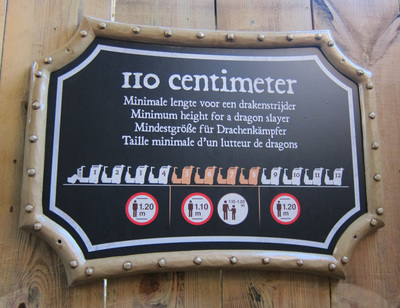 You must be at least 1m 10 tall in order to ride. 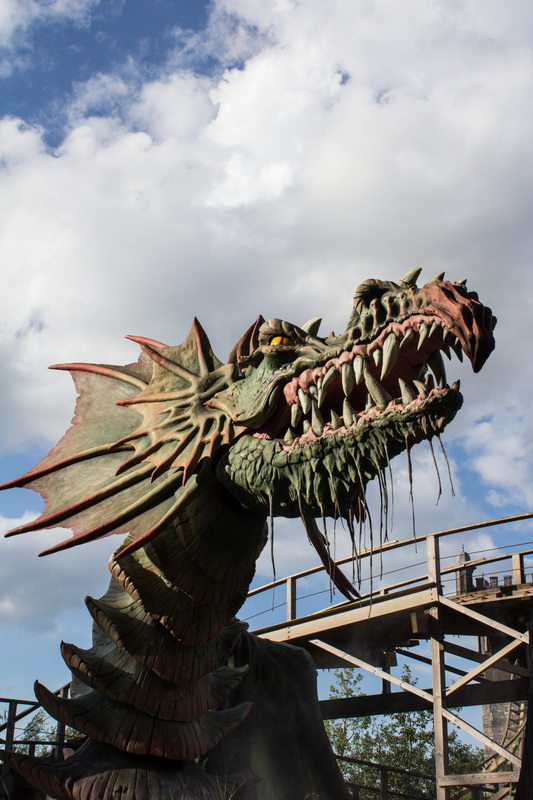 There was once a small kingdom that was completely controlled by a dragon. Not just any dragon, no, a terrible monster that could breathe fire. 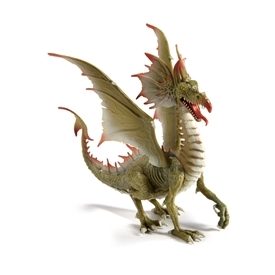 It lived in a stinking bog, where he guarded large golden dragon eggs. 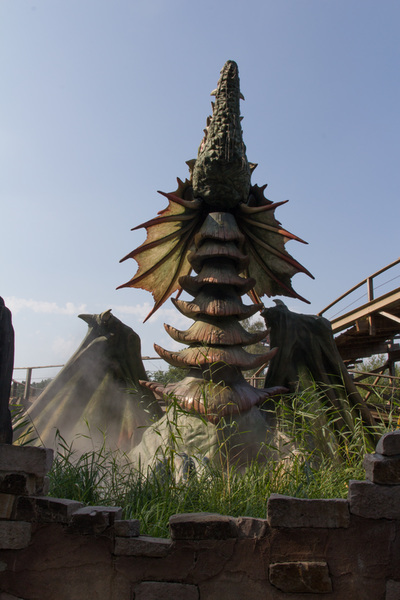 The gigantic creature would not hurt a soul, just as long as he was sufficiently fed. 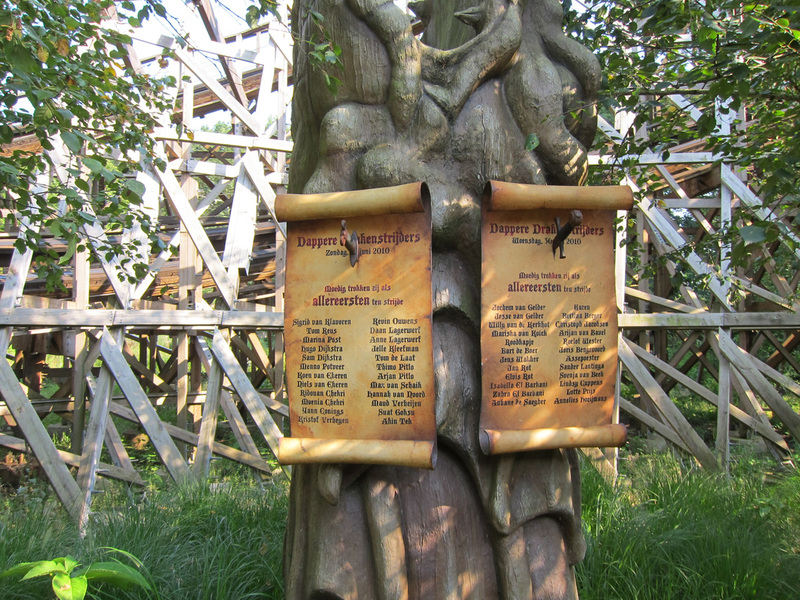 And he was picky. 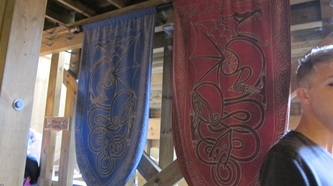 He demanded that the king should send him two fresh sheep to eat every day. 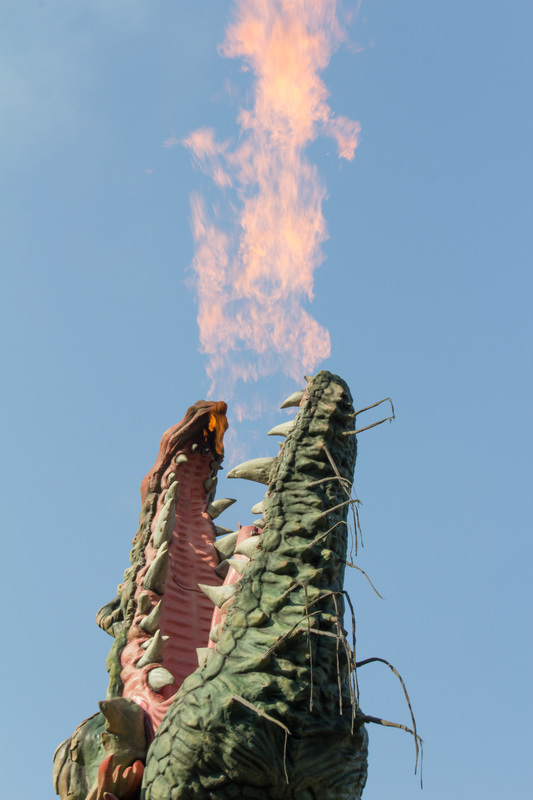 So it happened that the sent someone to the bog every morning, to satisfy the dragon with a couple of sheep. 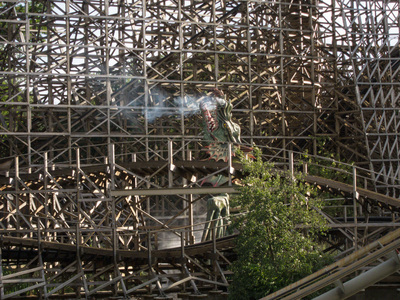 For years this ritual was repeated. The king thought: As long as the dragon is eating sheep and not people we can't complain. 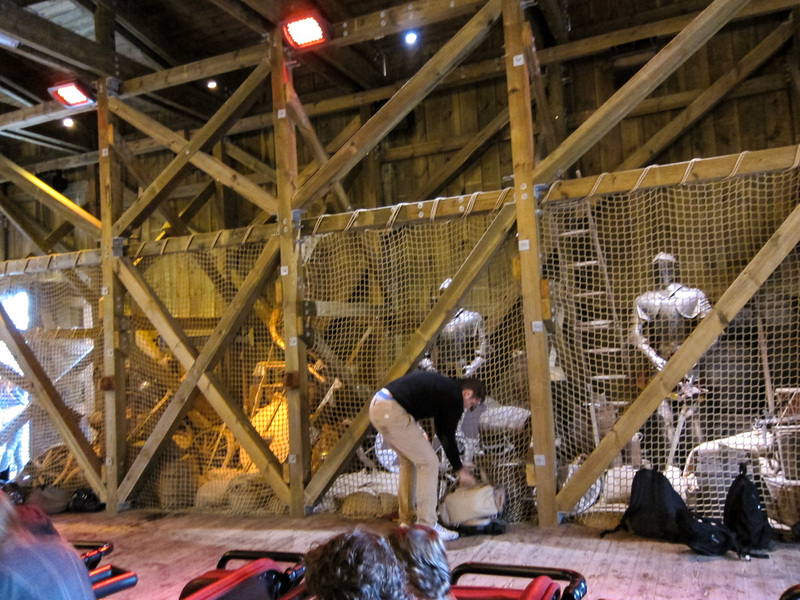 Alas, one day the king’s advisor came running to the king in a desperate panic. 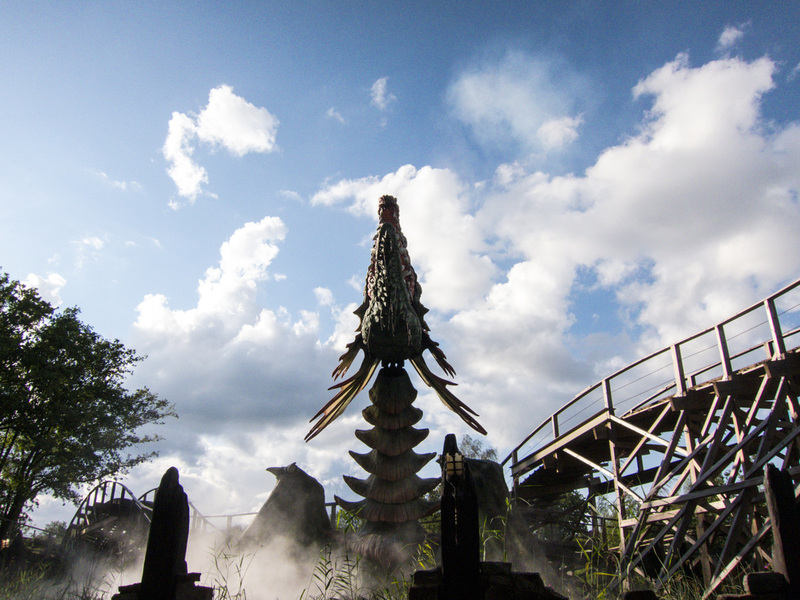 "Majesty, Majesty! 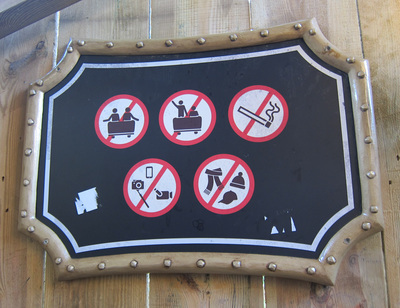 I bring bad news!" 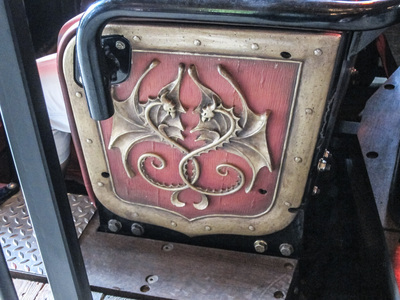 "Just you calm yourself and sit down first" said the king calmly “And then tell me what is the matter" "O Majesty, Its horrible!" 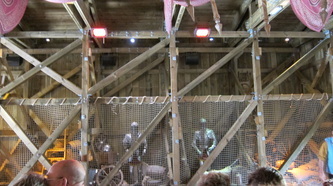 cried the advisor animatedly "we have run out of sheep!" 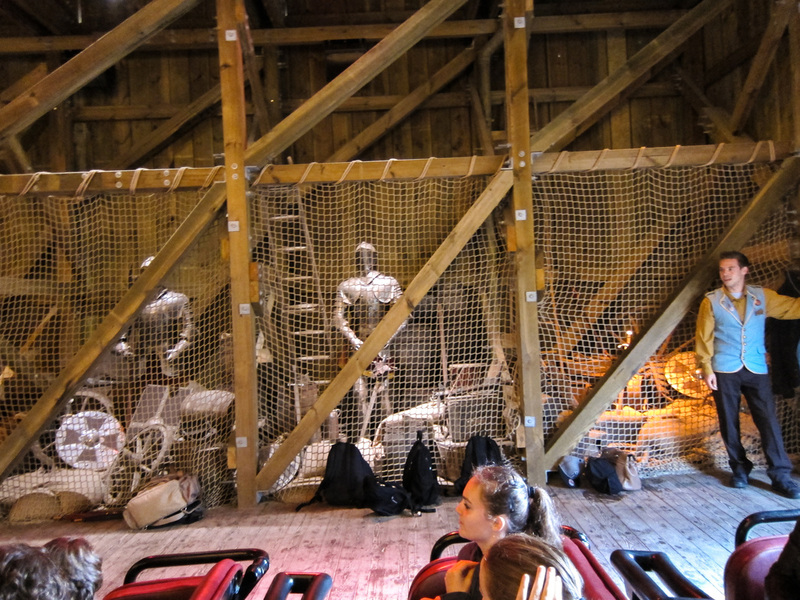 “We have run out of all the sheep? !” the king repeated astonished “Its as I say majesty! 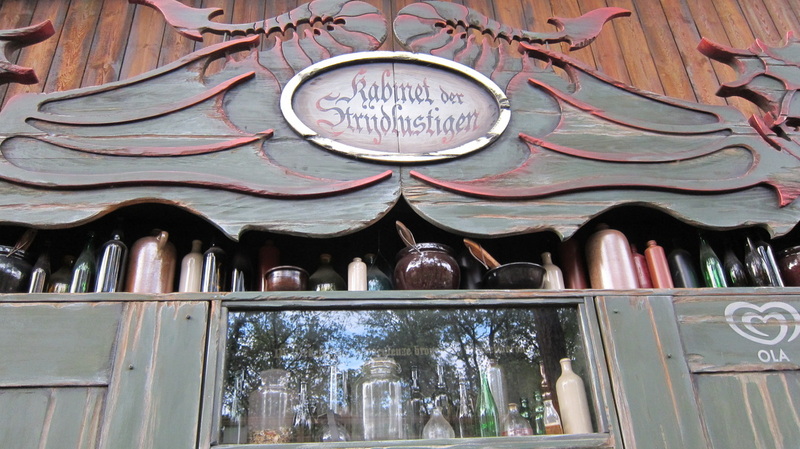 There isn’t a sheep to be found anywhere in the entire country. 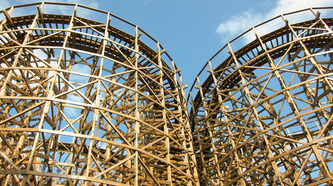 You know what this means. The dragon will go wild if he doesn’t get his daily portion of sheep!” “O dear what to do now?” said the king “In any case we will have to tell him”. 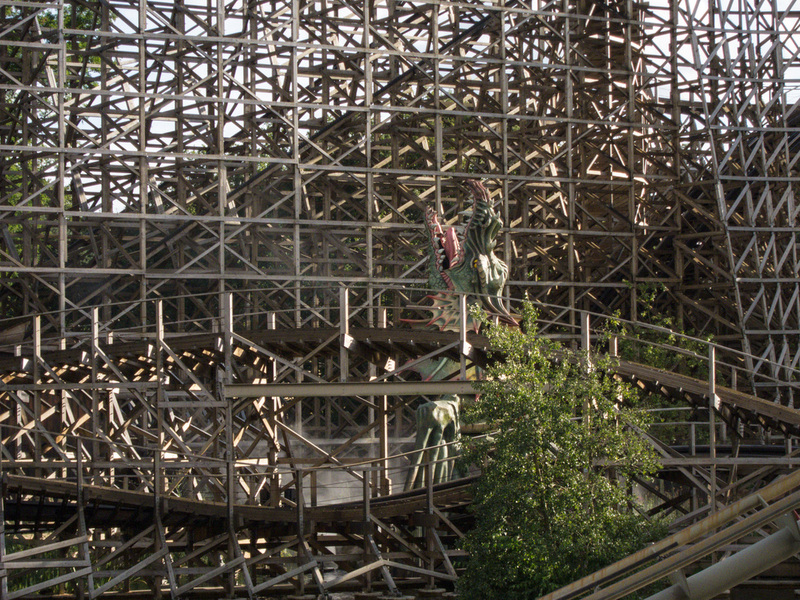 And there the brave king went. With a scared trembling advisor following closely they set out into the woods. A winding path eventually took then to the soggy bog. Through the fog they could vaguely make out the sparkle of a few golden eggs. 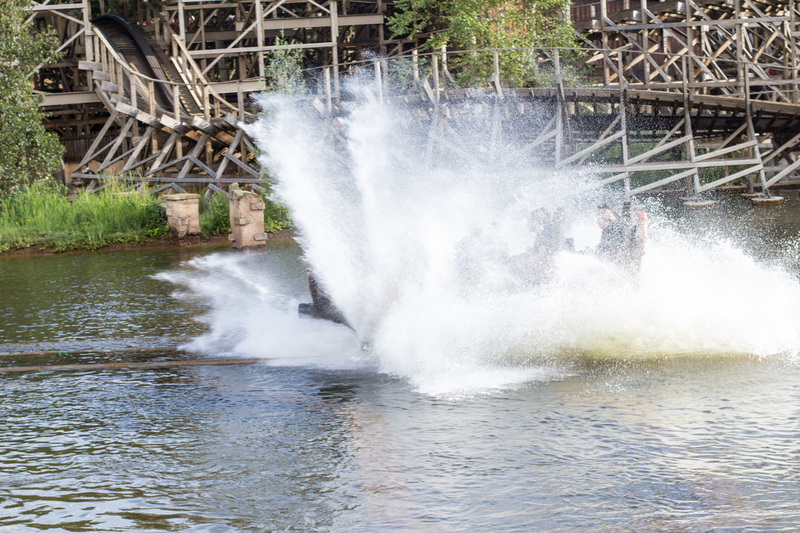 Op a small wooden bridge they suddenly stopped when a hideous sound welcomed them. “WRAAAH!” Roared the dragon who emerged from the mist. 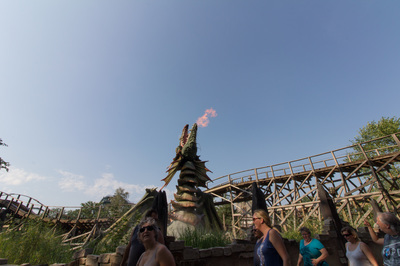 “Here we have the king himself! 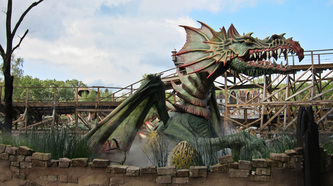 Wrahaha!” He leapt forward and smashed his mighty tail into the water so hard that it created a tidal wave. “But what brings you here dear king?” “It’s like this” the king started as calmly as possible “As you know I have two sheep delivered to you every day. 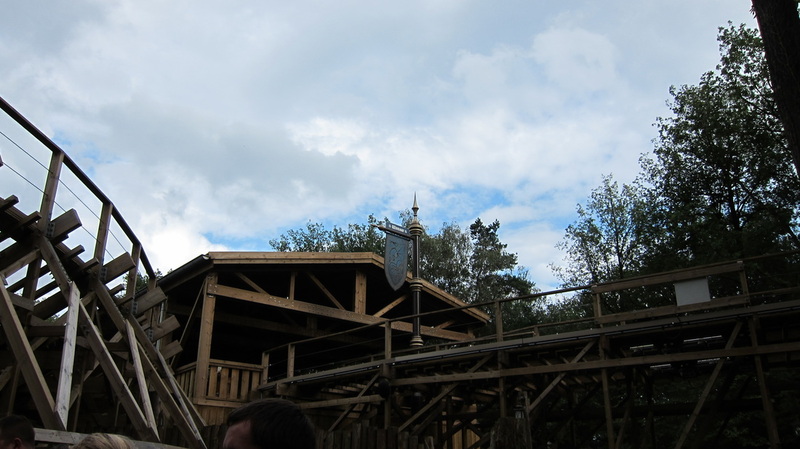 However..” The king hesitated for a moment and took a deep breath. Then he confessed “We have run out of sheep” ”That’s not very good king” said the dragon “Then I will have to eat you and your little friend! Wrahahah!” The advisor hid behind the king trembling with fear. But he said bravely: “You could do that, but then who will make sure you are fed every day?” “Oh king I was only joking” The dragon said in his sweetest voice, and the advisor looked very relieved. 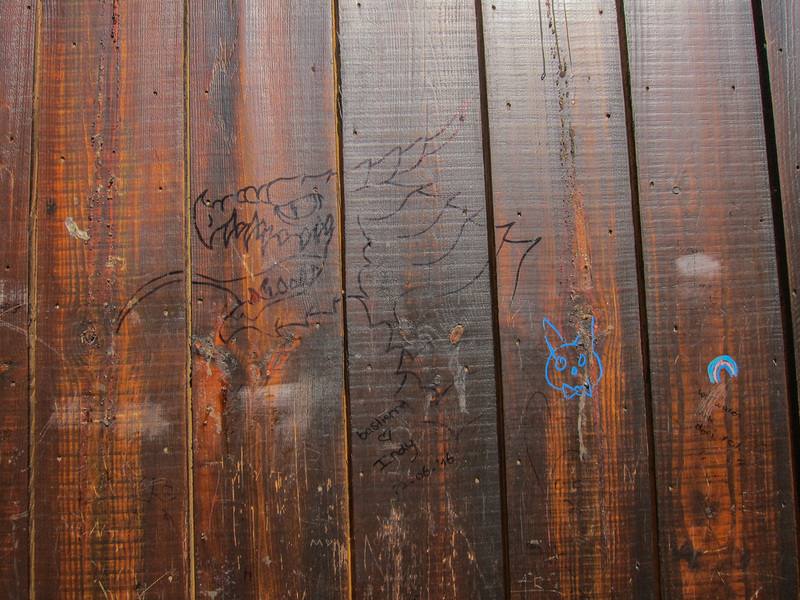 “Old men like you are far too tough to eat… but you know what?” the dragons face suddenly turned cruel. “Deliver to me a young girl for breakfast every day! 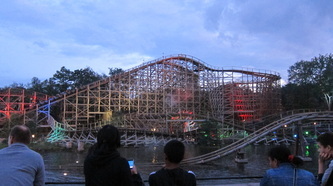 Wrahaha! Delicious!” The king and his advisor were schocked. 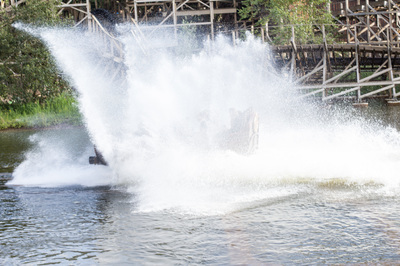 “A..a.. young girl? 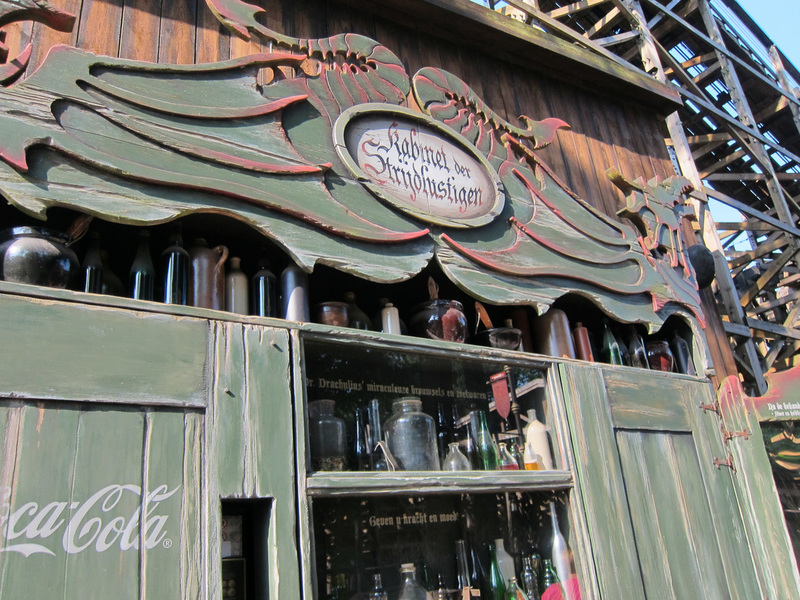 !”The king stuttered astonished. 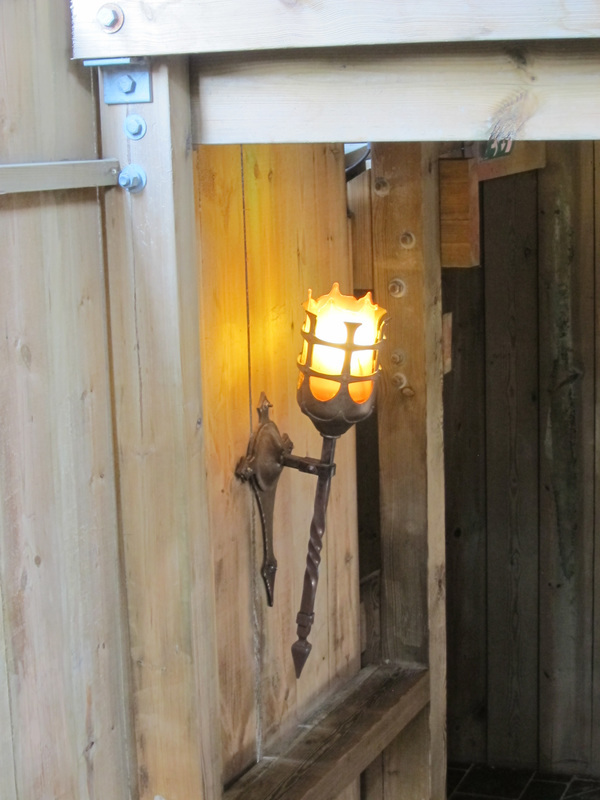 ”I could bring you fresh fish or delicious hams. 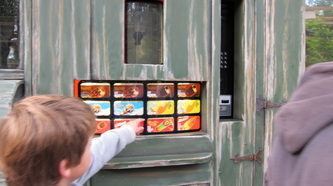 My cook can prepare meals for you every day with the spiciest peppers and the finest fruits. “ The king named a few other tasty things to change the dragons mind. 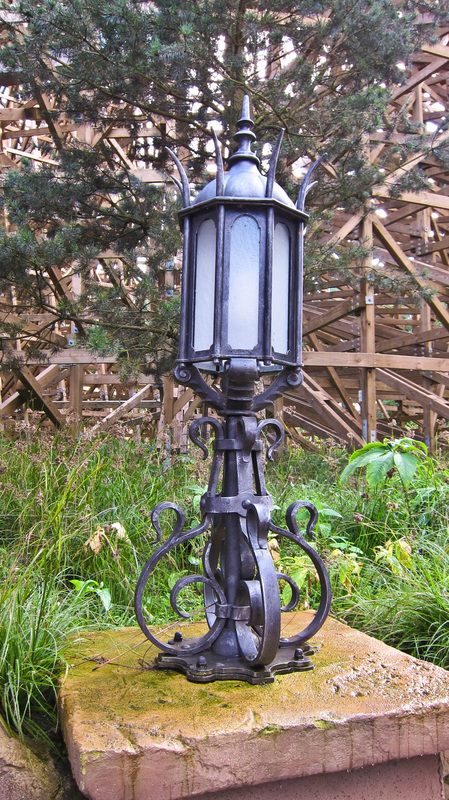 “No little king.. a nice tender girl it must be.. one each day! 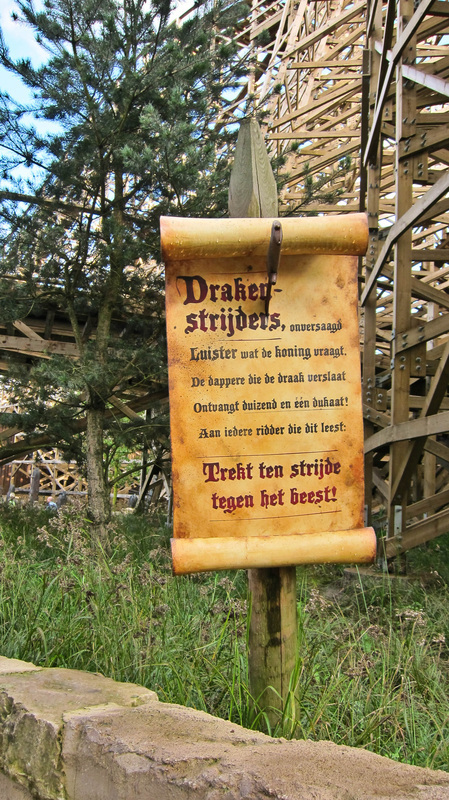 Otherwise I will make trouble for you!" The dragon roared wildly. 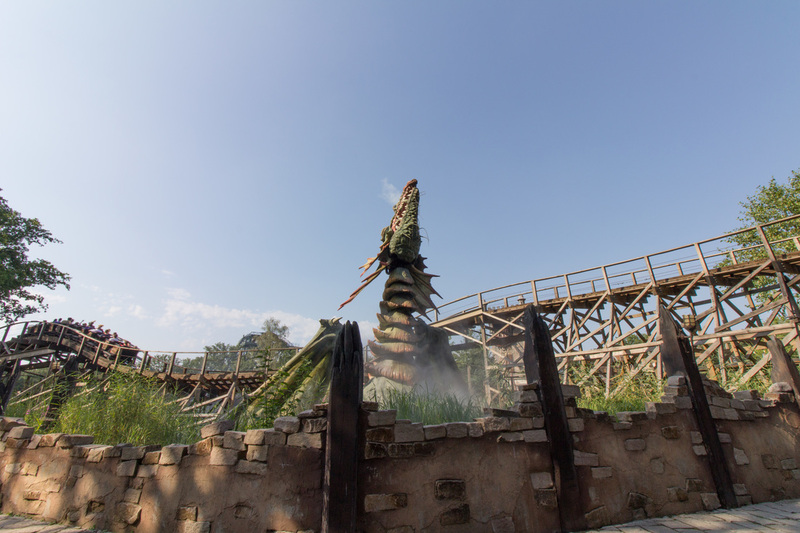 He turned and with a terrible swish of his tail he threw the two men out of the swamp. Go to battle with this beast! 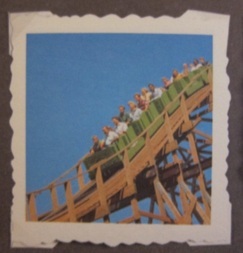 It was a terrible time. Every morning a girl was fed to the dragon . As well as this the dragon also consumed a great deal of strong young men. They had all tried to defeat the dragon but kept breaking their swords on the dragon’s hard scales The king became sadder and sadder . 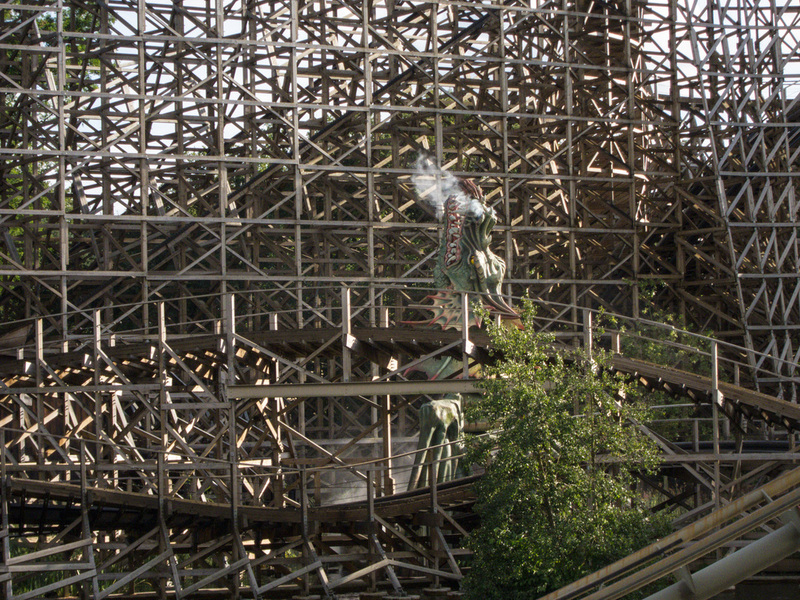 He did not know what to do. 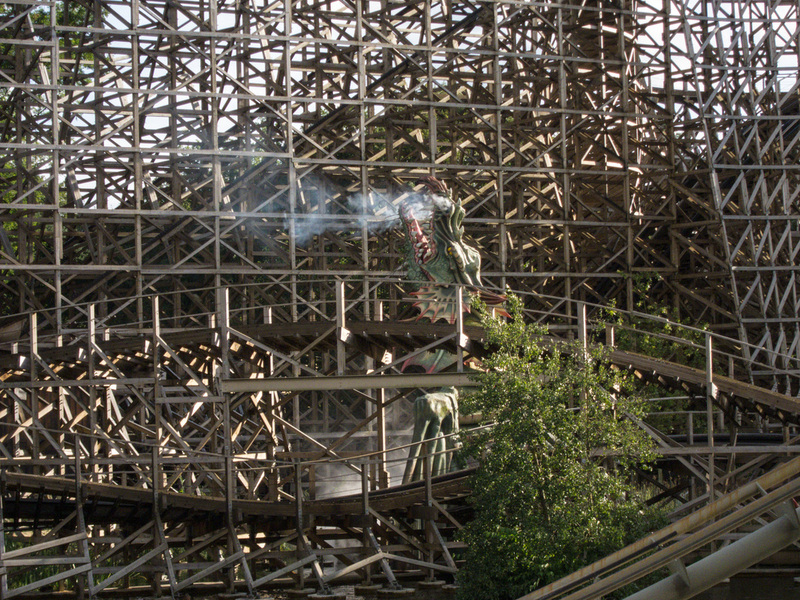 One afternoon the thing that he had feared for weeks finally happened. Everyone looked astonished and the king asked: “And who are you?” “I am George” said the boy. “I come from a land far from here. 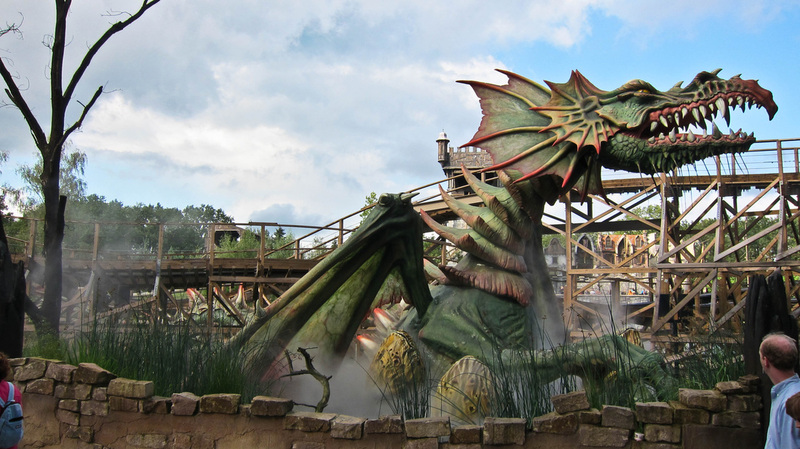 I have come to fight the ruler of water and fire.“ “But how do you plan to accomplish this?” asked the king. 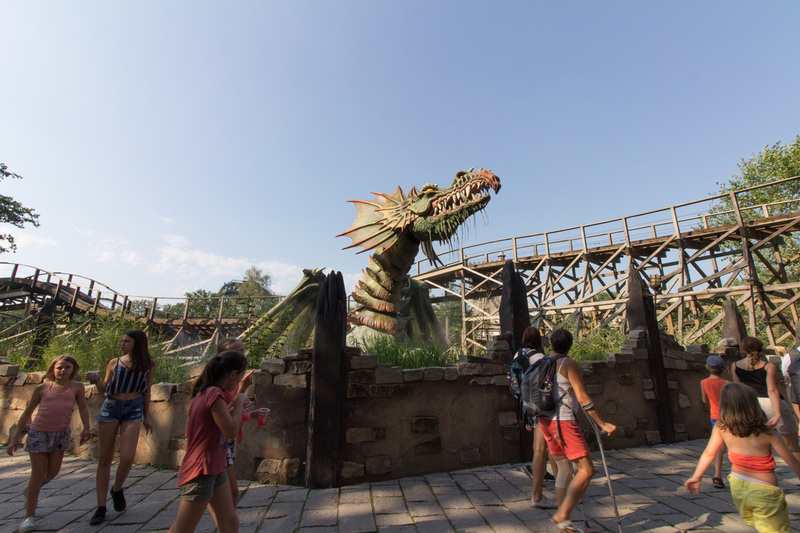 “This dragon is very strong and has defeated many brave knights” “You need to strike a dragon where it is most vulnerable” George answered. 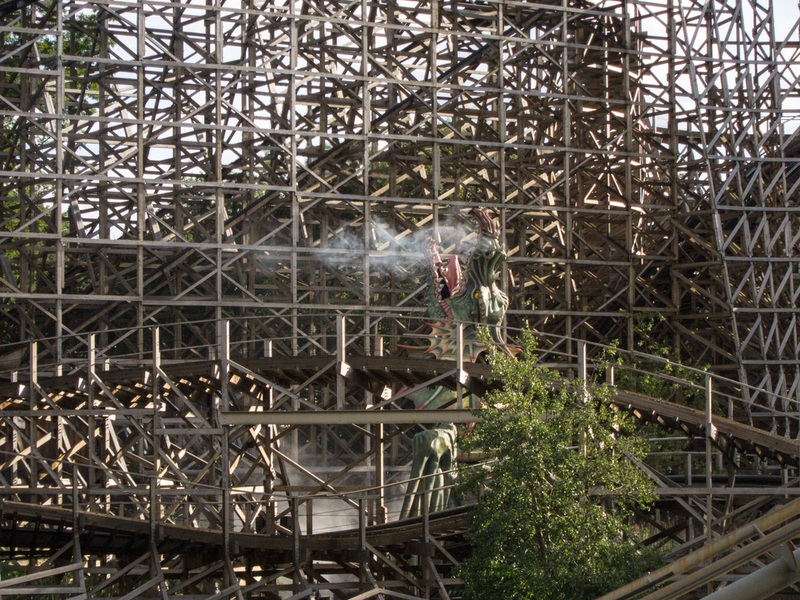 “I wish you luck” said the king, but his face did not inspire much confidence. 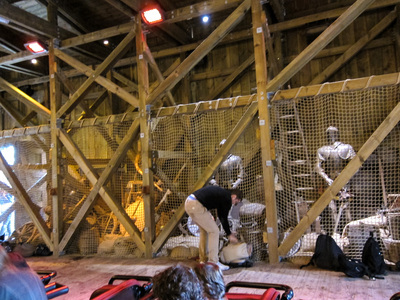 “In our Gear house you will find harnesses, shields and weapons.” “Thank you” answered George “You can count on me!” He visited the Gear house and helped himself to the smallest harness. It fitted him perfectly. 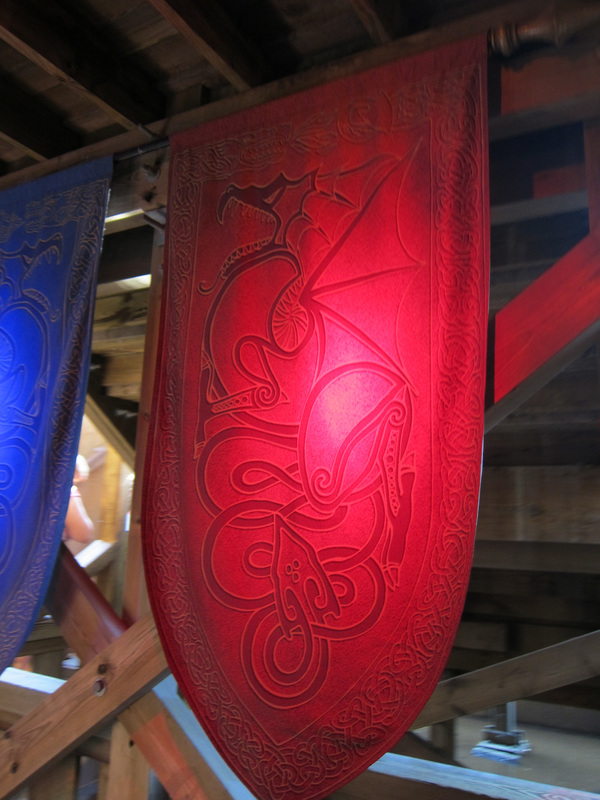 He then provided himself with a shield and a lance that was twice as big as himself. 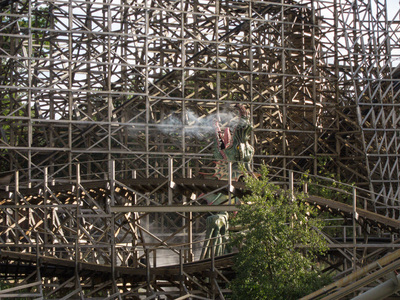 He then mounted his horse and set out into the forest. By nightfall George arrived at the misty bog. 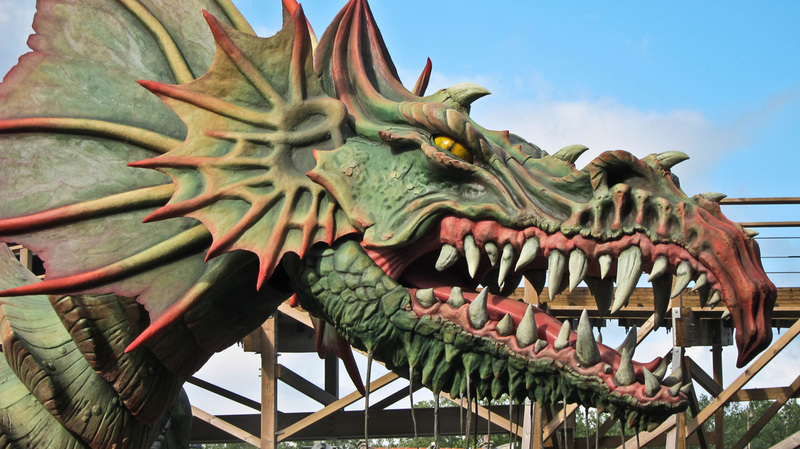 The dragon couldn’t stop laughing when he saw the slender figure of the little knight. “Wrahaha! 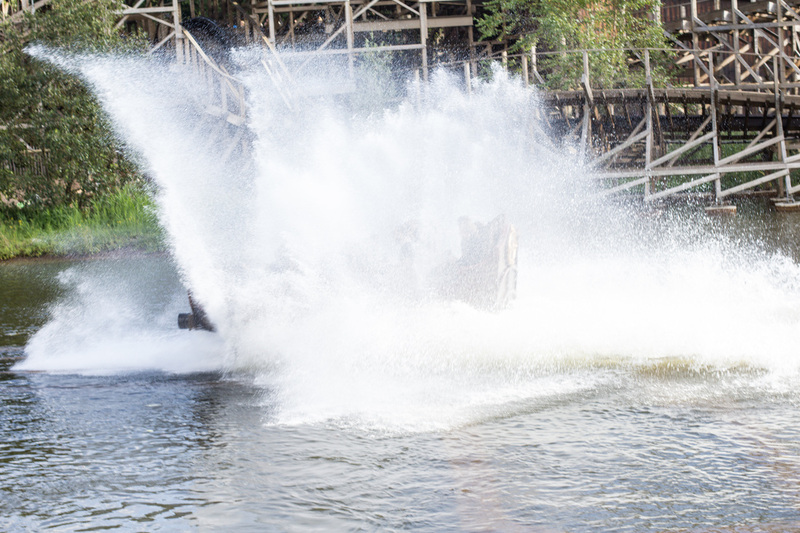 It cant get much crazier then this!” He put power to his words by slamming his tail into the water and turned the bog into a swirling vortex. He opened his mouth and WHOESJ! 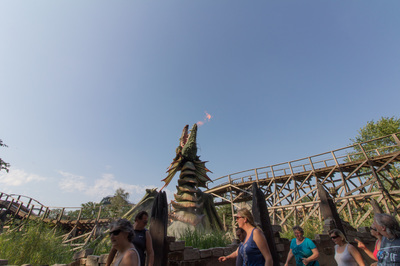 The flames set fire to two pine trees on the shore. 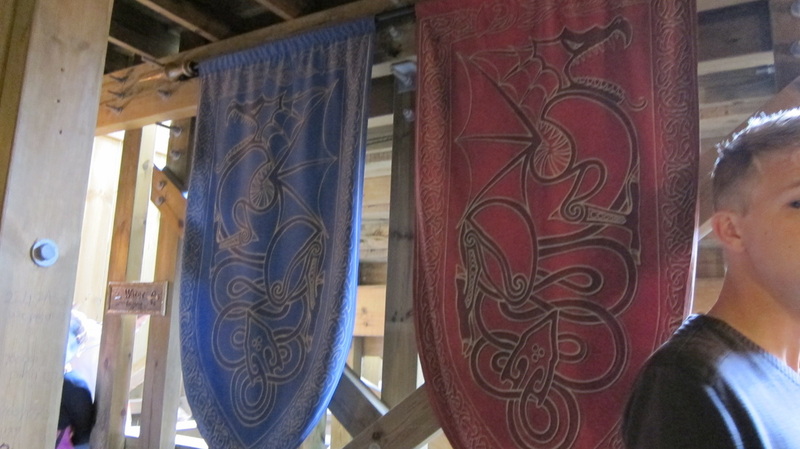 “And with whom do I have the honour?” asked the dragon. 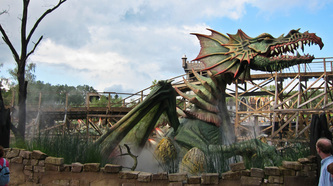 George jumped off his horse and said: “I am George, The one true ruler of Water and Fire” The dragon looked surprised for a moment only to burst out laughing again:”Wrahaha! 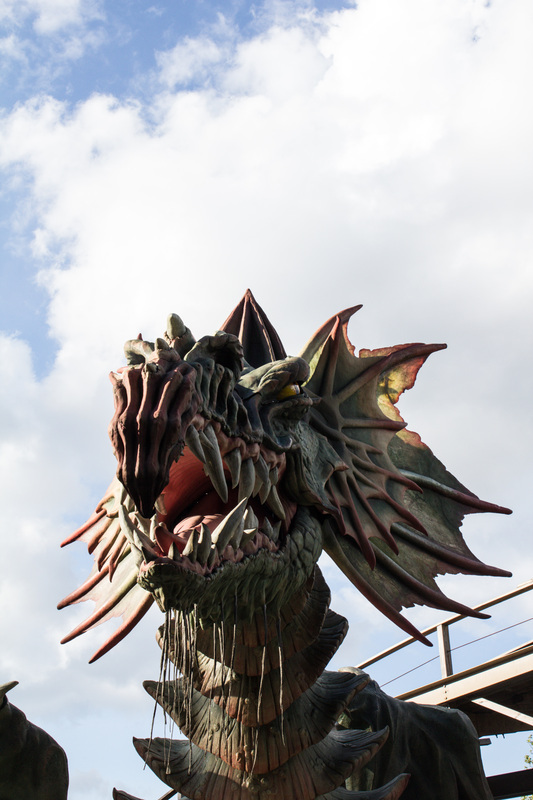 You... the ruler of water and fire? 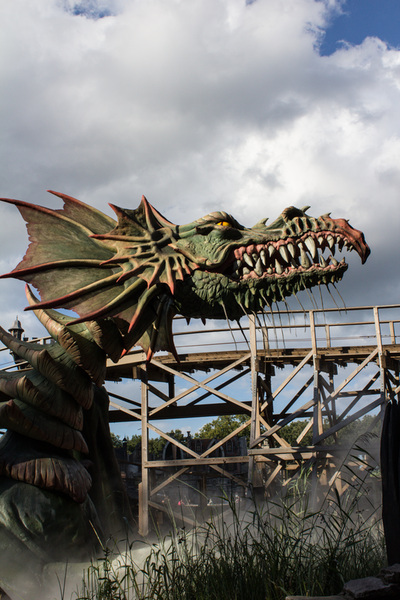 Did you not see what I just did?” “Of course I did” said George “But that’s Childs play compared to what I did” The dragon looked even more surprised and George continued: “I have set fire to the water of the ocean!” “The water of the ocean? 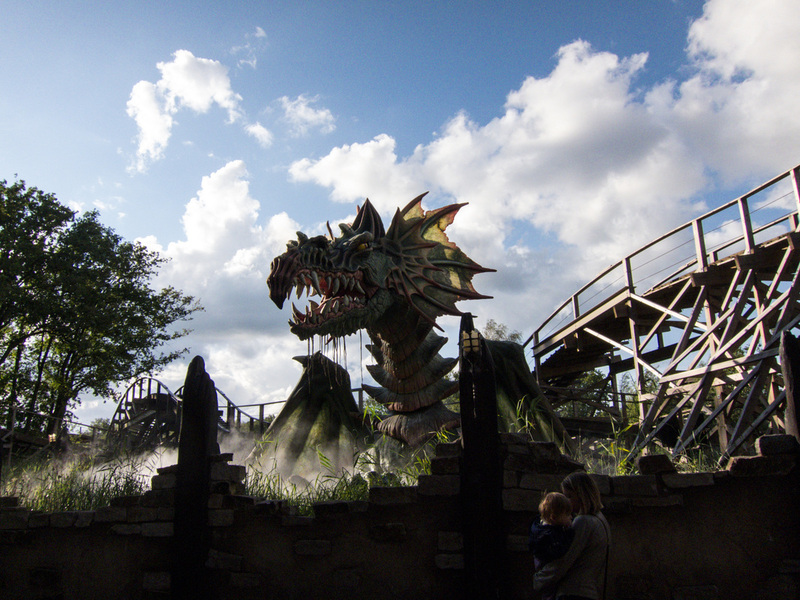 !” roared the dragon. 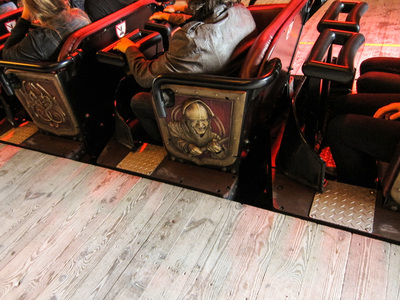 “That’s impossible” “It’s very possible” said George “The whole sea is on fire at this very moment, see for yourself. 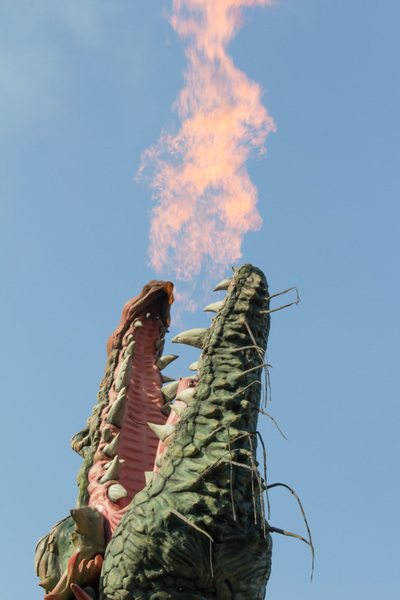 You can see it burning even from this distance.” George pointed to the red evening sunset above the treetops. 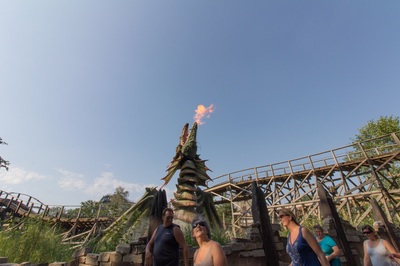 The sun was setting so beautifully that day that it looked for all the world as if an enormous fire was raging on. The dragon was clearly unsettled by this statement. “This cannot be” it mumbled and it stretched its neck to get a better view. 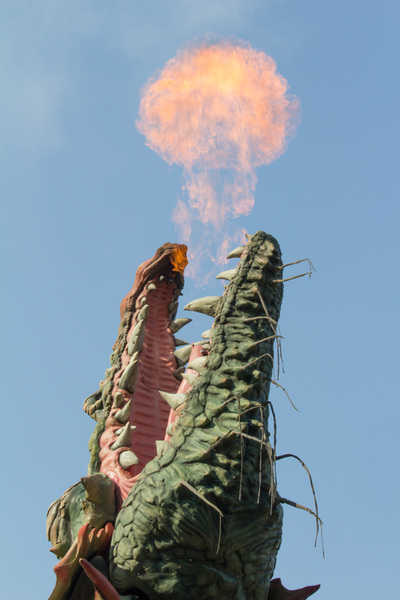 “I mean I can see a red glow” he said hesitantly. 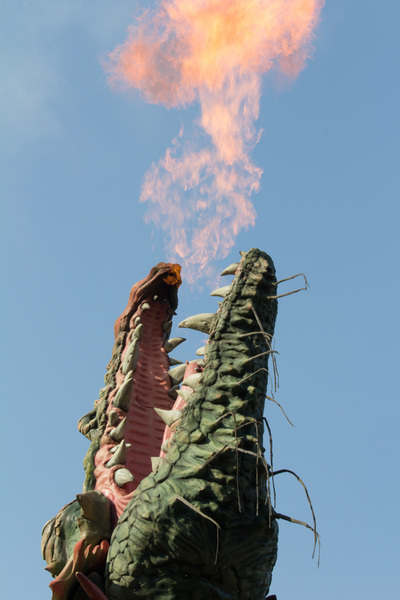 “Stretch yourself further and you will be able to see the flames themselves!” At the moment that the dragon stretched himself completely George leapt forward and pierced the heart of the monster with his lance. 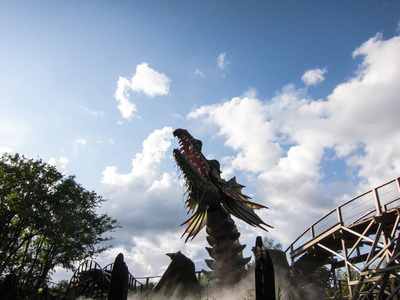 A great shock rippled through the large body of the dragon. For a moment it did not move a muscle. Then suddenly it let out a deafening roar before tipping over backwards and crashing into the bog. 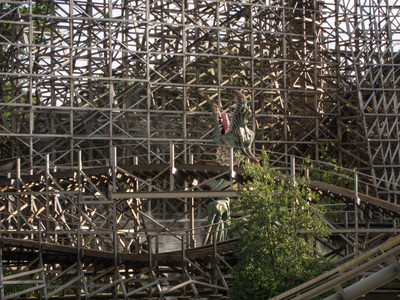 The terrible cry of the dragon was heard throughout the land but it was only short. The dragon was dead. The crown cheered and even before the king could say another word the people took George onto their shoulders. They threw him up into the air and then caught him again. 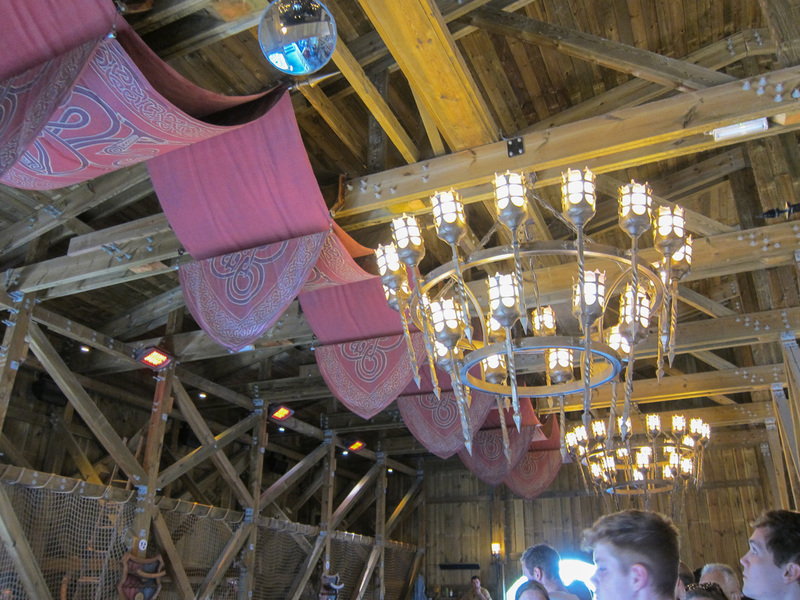 They sang and danced and everyone celebrated. Later that night George left the festivities unnoticed and rode off on his horse. 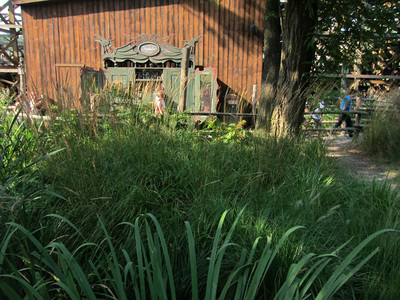 No one ever saw him again but everyone in the little land lived happily ever after. Wheelchair users can enter through the exit. 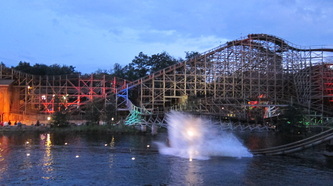 In front of the steps to the left. 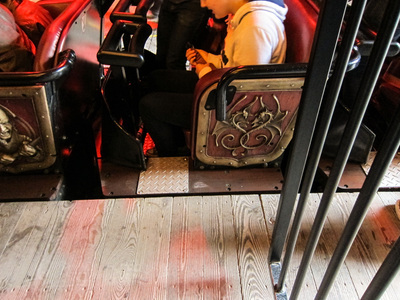 You will need to be able to be transferred from your wheelchair in order to ride. 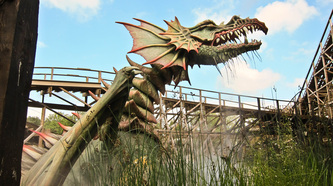 You can buy the George and the Dragon making Of DVD at the Efteling Webshop!